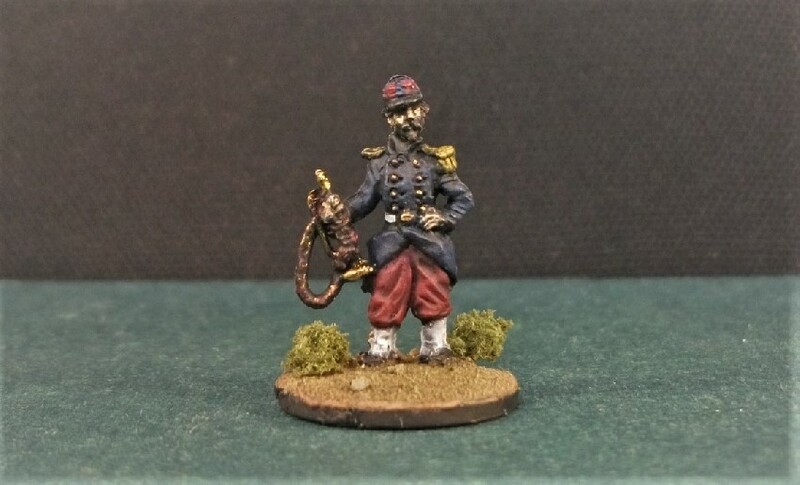 Having been very much enjoying painting Strelets characters from their Crimean War Big Box range, I thought it was time to turn my attention the French officer corps. 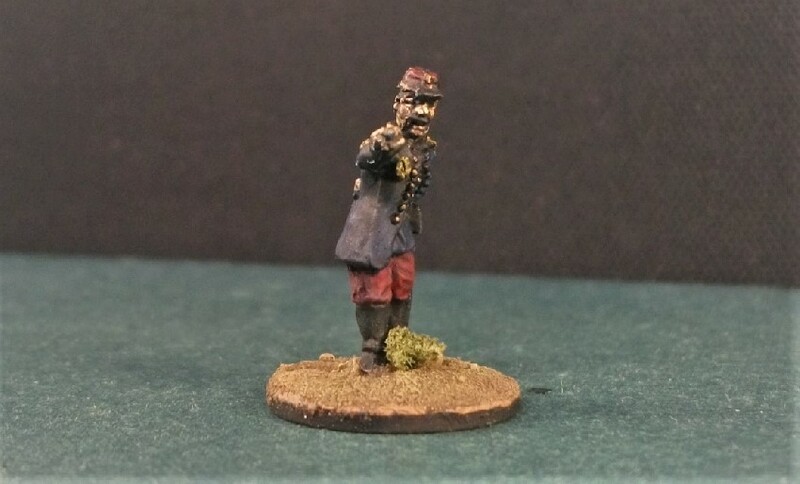 These figures came from their “Last Assault on Sevastopol” box which, in addition to the two dozen officers, also supplied other sprues of French Zouaves, light and line infantry. Unlike their “Heavy Brigade” set, “Last Assault…” did not come with a detailed list of named individuals. 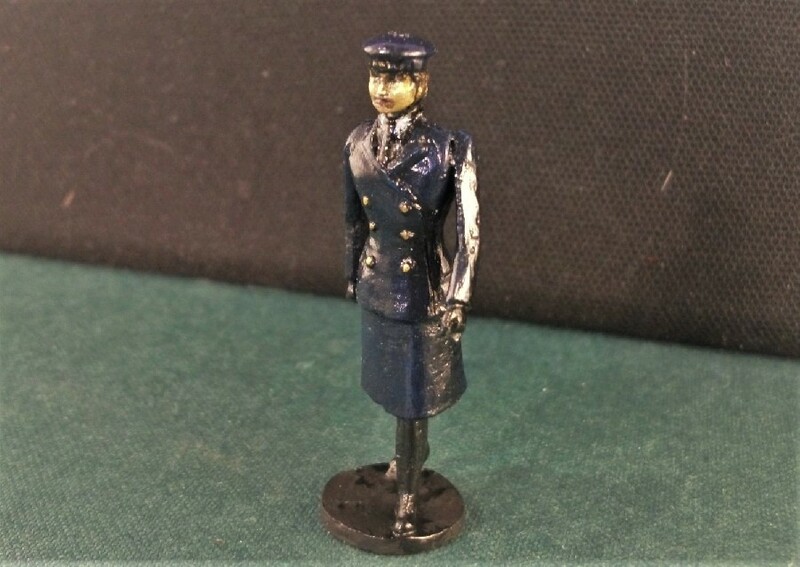 I believe most of the figures are intended to be generic officers therefore although, as Plastic Soldier Review suggests, a handful are undoubtedly intended to be specific personalities. Pioneering photographer Roger Fenton took a good number of photographs of members of the French army including anything from senior commanders to common soldiers, and even a female vivandière (a version of which Strelets also modelled for the Heavy Brigade set). 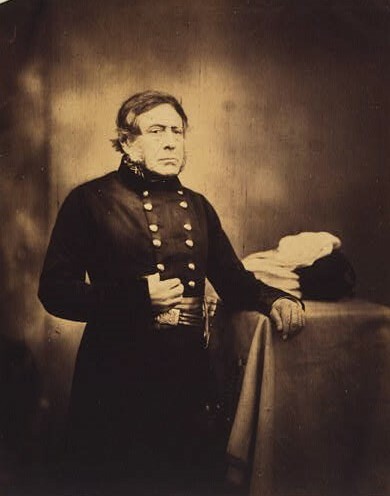 Marshal Pelissier by Roger Fenton, 1855. 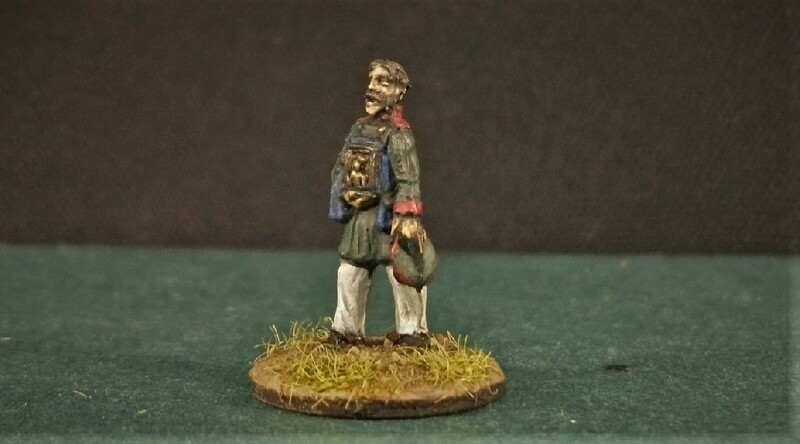 Below, my painted figure certainly bares comparison with Pelissier as depicted in Fenton’s image. Now I look at him, the black and white photograph suggests a brighter colour than the light blue I have painted around his waist, perhaps yellow. Furthermore, le pantalon rouge looks more distinctly le pantalon bleu! Never mind, the white hair and dark moustache have been reproduced well enough. Pélissier was sent by Napoleon III to the Crimea to replace the existing commander Marshal Canrobert, who was judged too cautious. A more vigorous approach to the siege of Sevastopol eventually reaped its reward with the French storming and taking the Malakoff Tower in September 1855, leading to the evacuation of south Sevastopol by the Russians. After the Crimean War, Pélissier was showered with awards from home and abroad including the title ‘1st Duc de Malakoff’ in recognition of the Sevastopol assault. The figure wears a number of awards and medals on his chest, the large silver cross being I believe a Légion d’honneur star (or plaque). Strelets have shown Pelissier holding what I believe is a piece of paper or map. 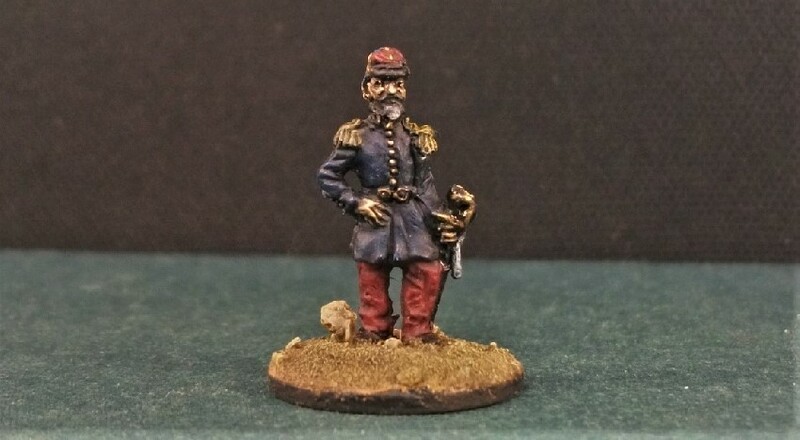 Another Fenton portrait of General Pelissier. They are referring to this figure pointing a finger with his hand tucked behind his back. Fenton actually took a number of photographs of Bosquet, including the one below. 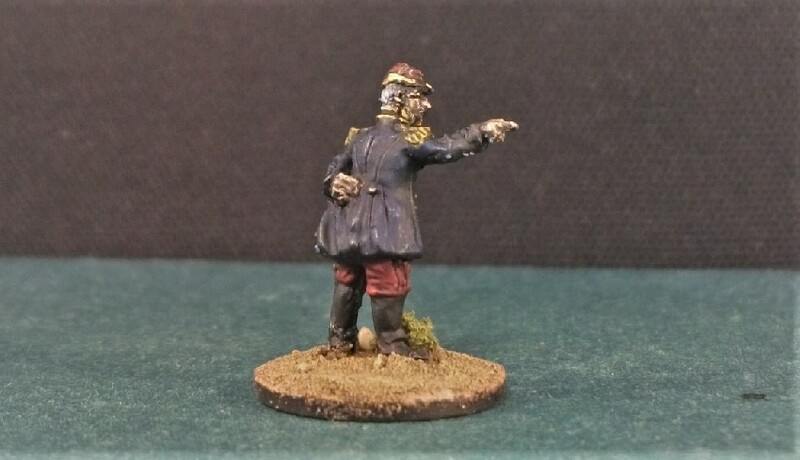 General Bosquet seems to have been quite a theatrical character, keen to be photographed in his trademark authoritative pointing pose! 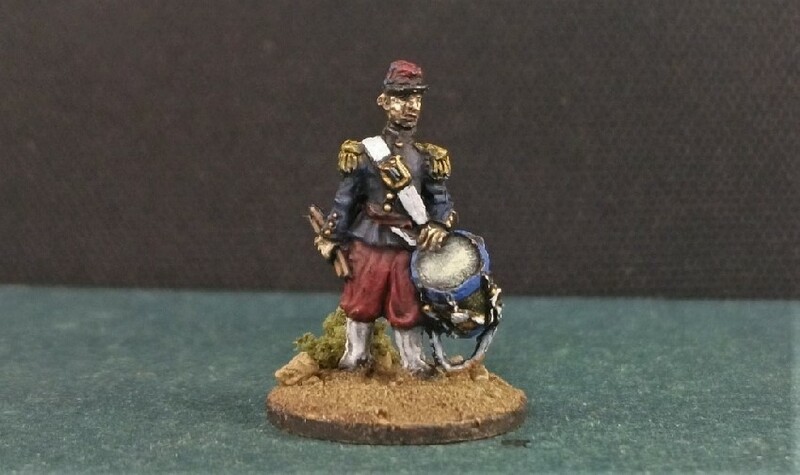 Pierre François Bosquet was an artillery officer who spent 20 years as a soldier in Algeria, during which time he variously commanded Algerian tirailleurs and later some line infantry, rising to the rank of General of Division. 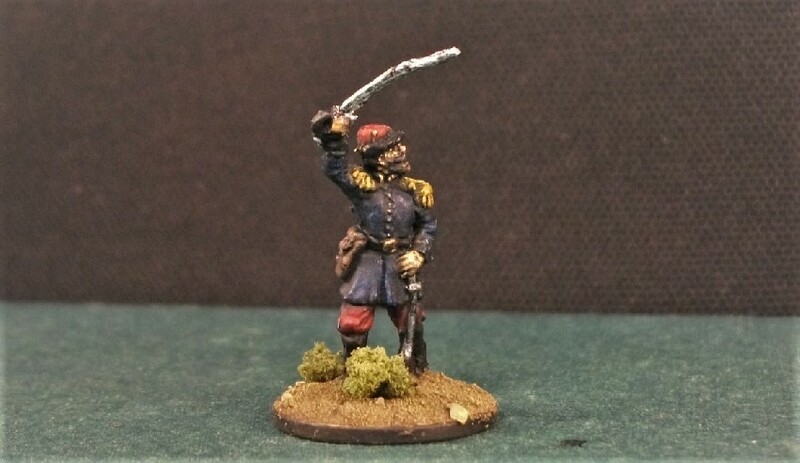 Serving in the Crimean War from the very early stages, his division led the French attack at the opening encounter at the Alma. C’est magnifique, mais ce n’est pas la guerre: c’est de la folie! Bosquet’s arrival with troops during the battle of Inkerman secured the Allied victory. Seemingly ever present in the forefront of all the action, at Sevastopol Bosquet personally led his troops both on the June attack to capture the Mamelon fort and also the great attack on the Malakov in September, during which he received a severe wound. He survived the war but ill-health led to his untimely death just five years later. 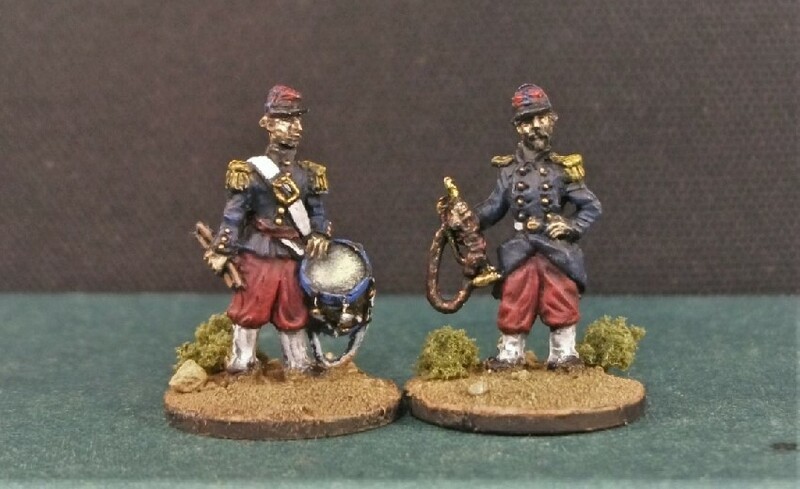 Two satisfying musicians with lots of colour to them, a bugler and drummer of the French army, 1855. 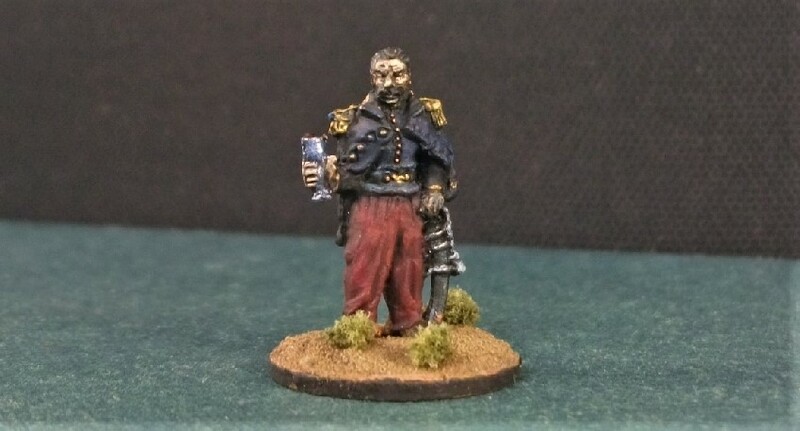 This next roguish officer seems to be enjoying a glass of something refreshing. I realised when painting this that I have never painted glass before. So, I’ve simply added to silver a little blueish hue, assuming that this old soak has just drained it of a fine ’48 Bordeaux. I like their idea of having his overcoat draped over his shoulders. If it’s not alcohol that helps my French officers through the rigours of the Crimean campaign, it’s tobacco. 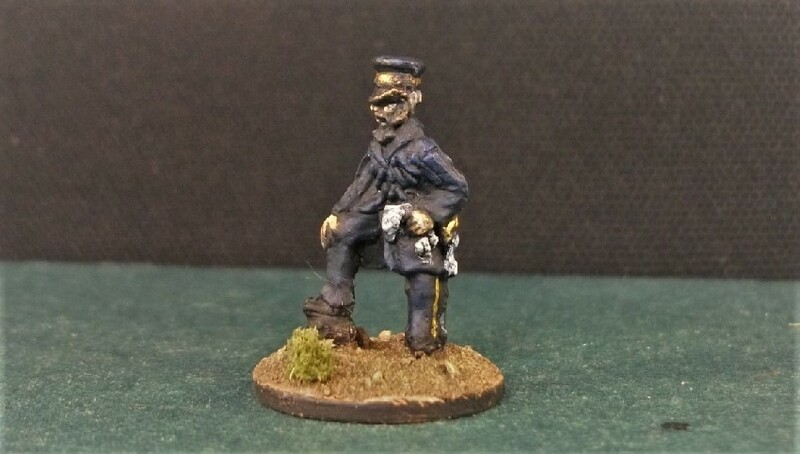 Here, a nicely campaign-weary officer contemplates another tough day in the trenches over a long pipe. 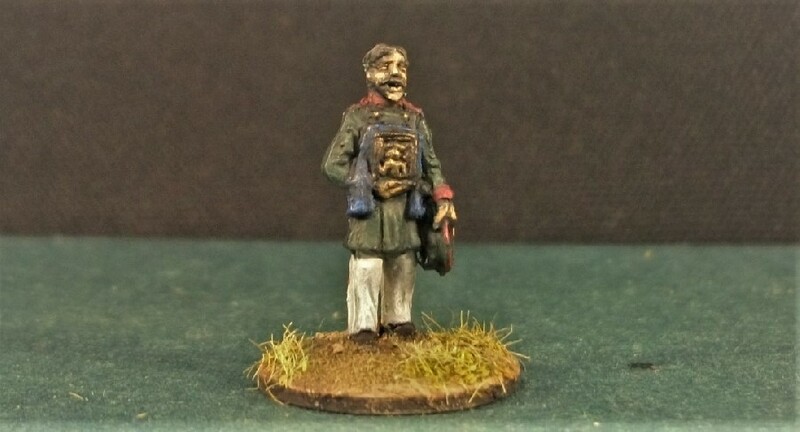 Hand tucked into his waistband, I fancy he might be enjoying a smoke, post-evening meal. 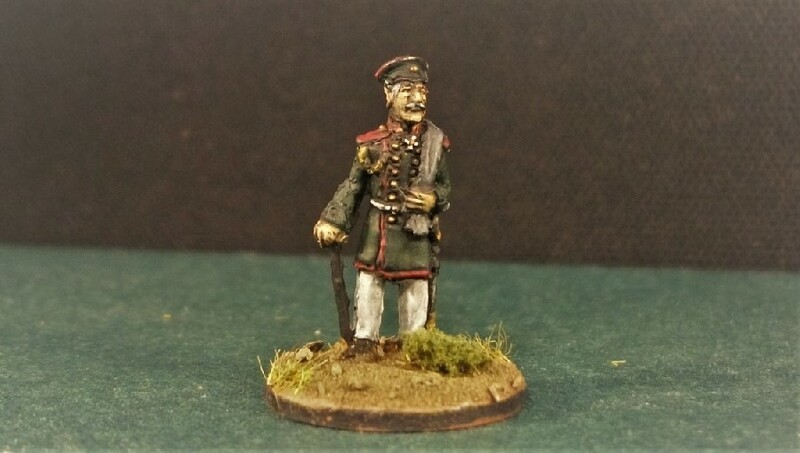 What I thought was one of the least promising figures has turned out nicely, I am particularly pleased with his greying beard and surprisingly interesting face, glancing askew. 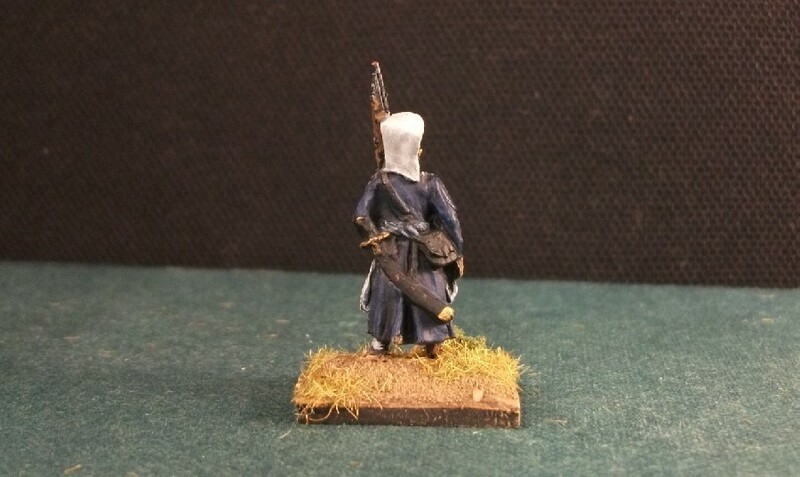 Next, another nice pose with a shoulder cape and hands clasped behind his back. 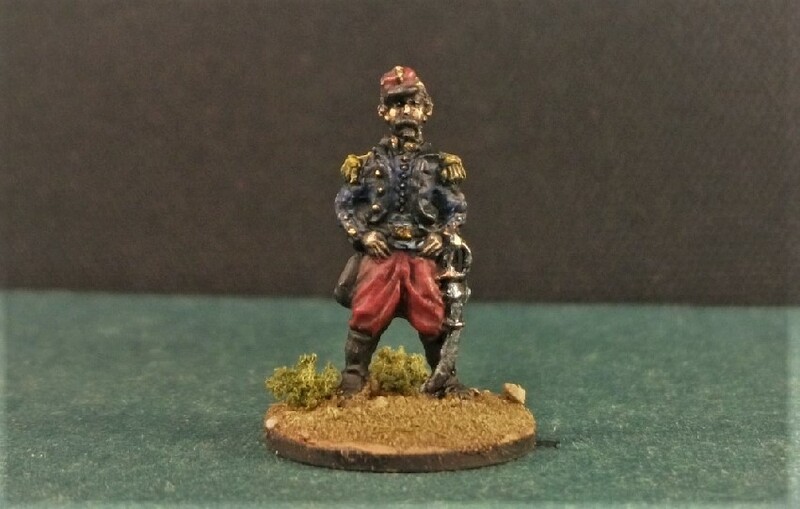 This chap was a victim of an accidental assault by my wife after I carelessly left him on the dining room table. 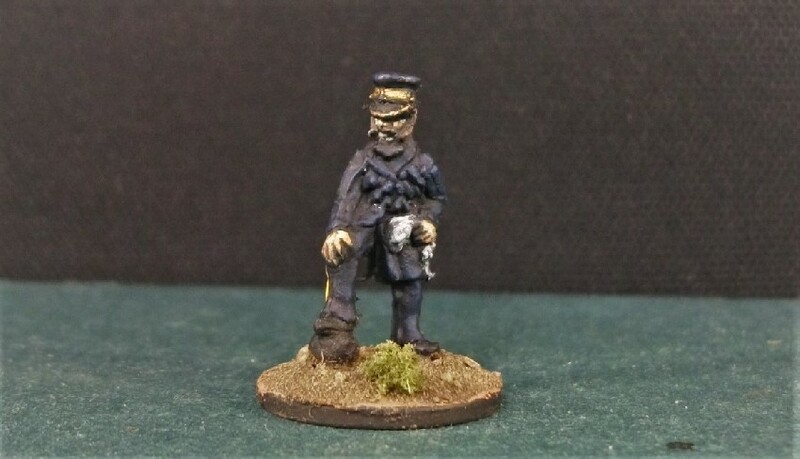 He has come through okay after corrective painting and hasty re-gluing, although he appears to be keeping a wary eye out for any further outrages. 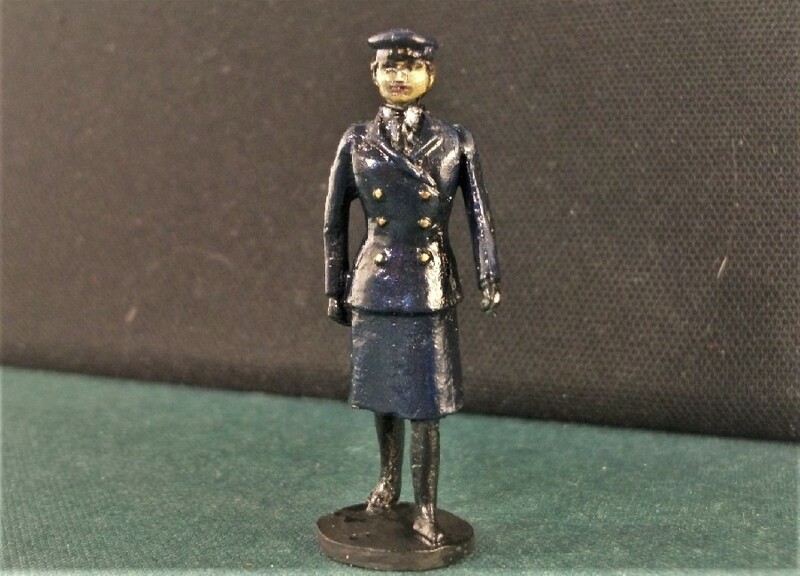 This is another figure which looked less promising thanks to the face being along the line of the flash from the mould. 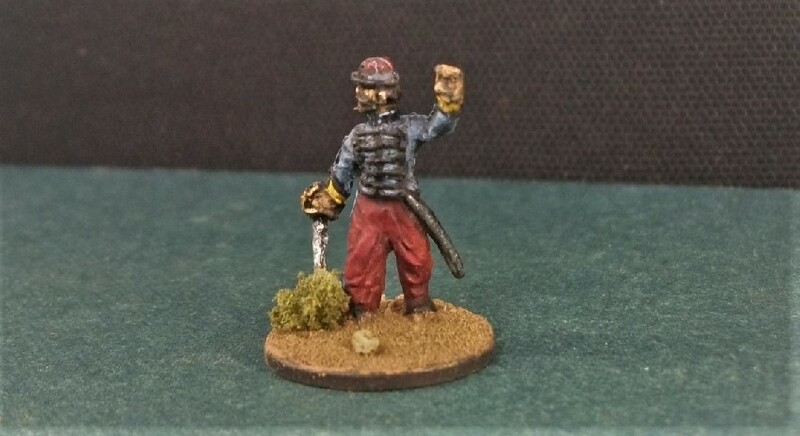 A little paint has improved my assessment of a convincing pose for a man leading an assault. 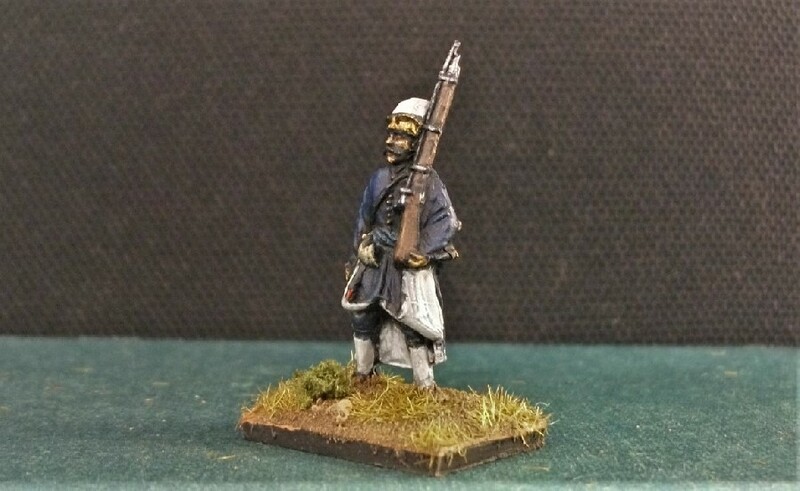 Finally, below is an officer of the Chasseurs d’Afrique, a regiment which I painted some years ago from Strelets range of Crimean War figures. 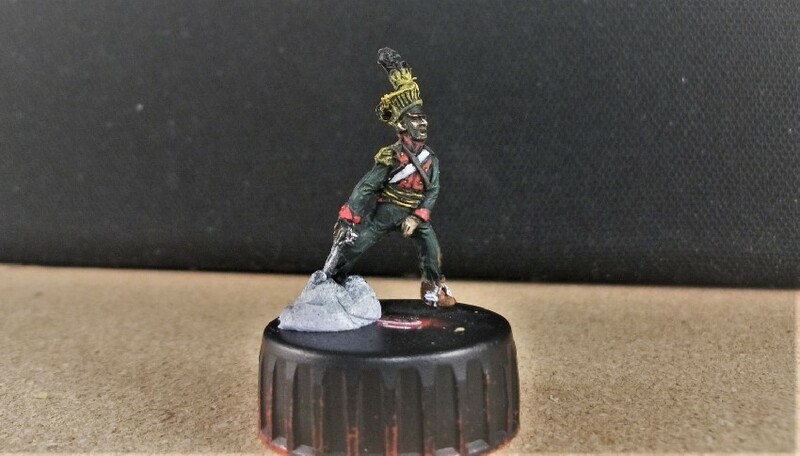 It’s not one of their best sculpted figures, another victim of the join on the seam, and it’s curious that his sword is drawn whilst on foot, but I like the ‘Chass d’Aff’ and felt it demanded inclusion! 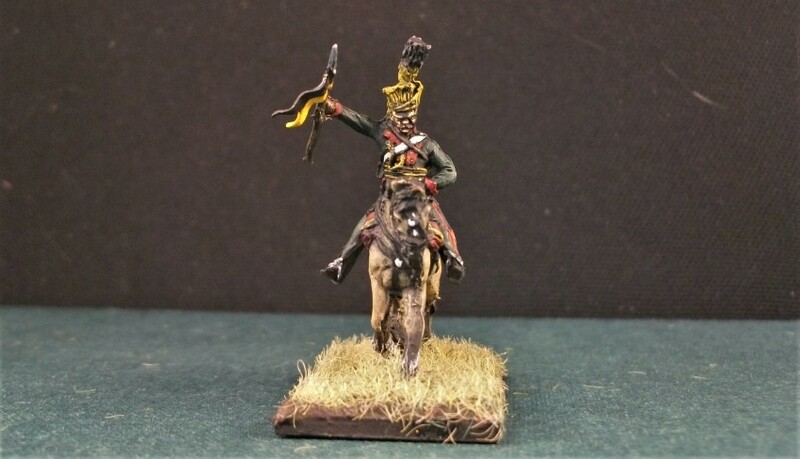 Fenton took some photographs of officers from this regiment, including this one below of a mounted officer in camp. 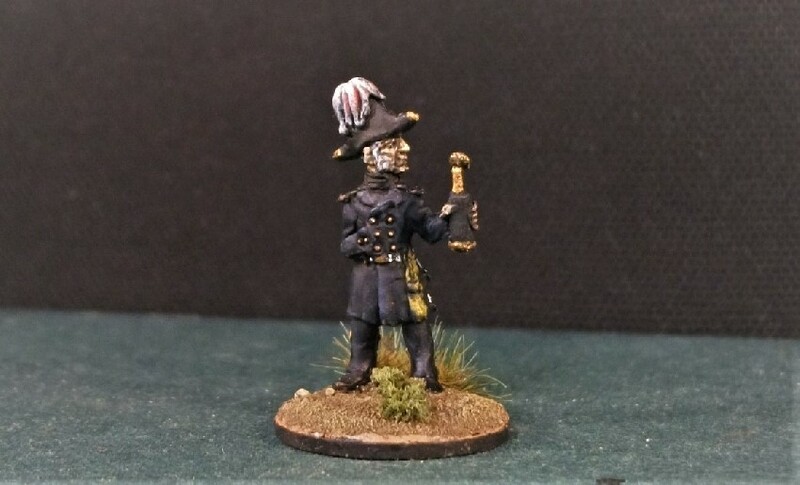 I’m toying with the idea of one more batch of these French officers, if you can stand it, before finally moving on to something new. 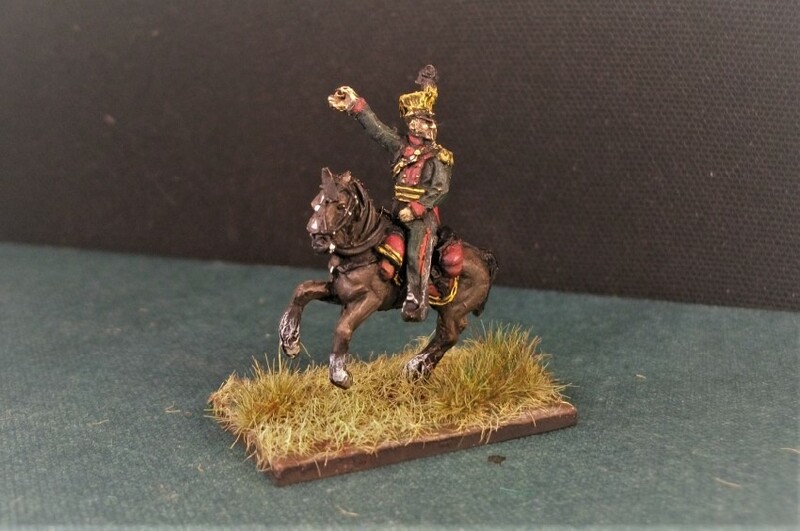 The commander-in-chief of the British army in the Crimean War began his army career playing a full part in the Peninsular War. 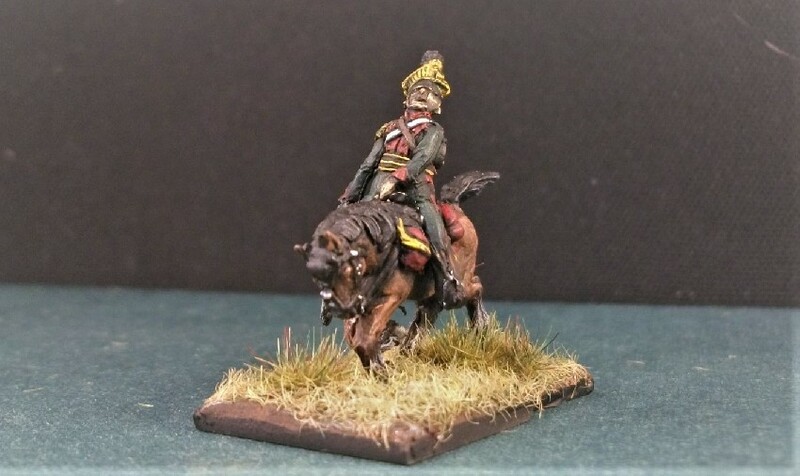 He later served in the Waterloo campaign as aide-de-camp and military secretary to Wellington. The carnage of the battle of Waterloo cost Somerset the amputation of his right arm. 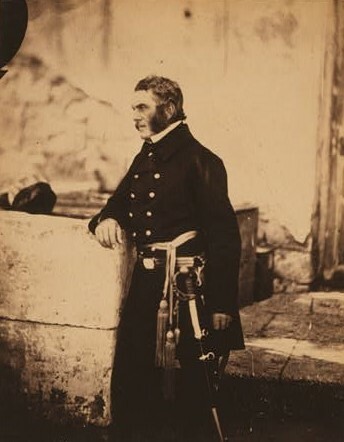 Fenton’s photograph of Lord Raglan in the Crimea, 1855. 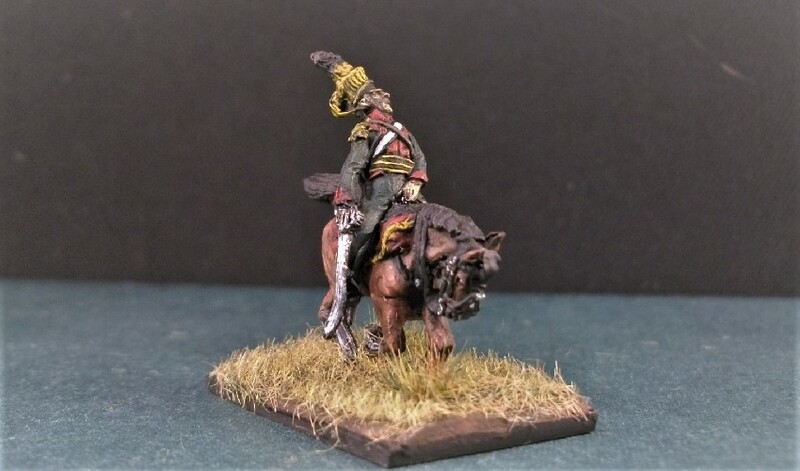 Somerset retained his close association with the Duke of Wellington and, having been promoted to Lieutenant-General during the years of peace after Waterloo, was appointed to command the British army in the Crimean campaign with a brevet rank of full General. 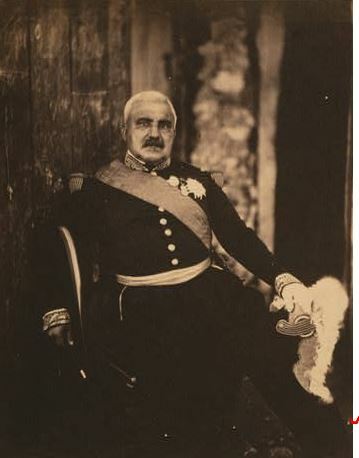 In 1852, he was raised to the peerage and became known as the 1st Baron Raglan. 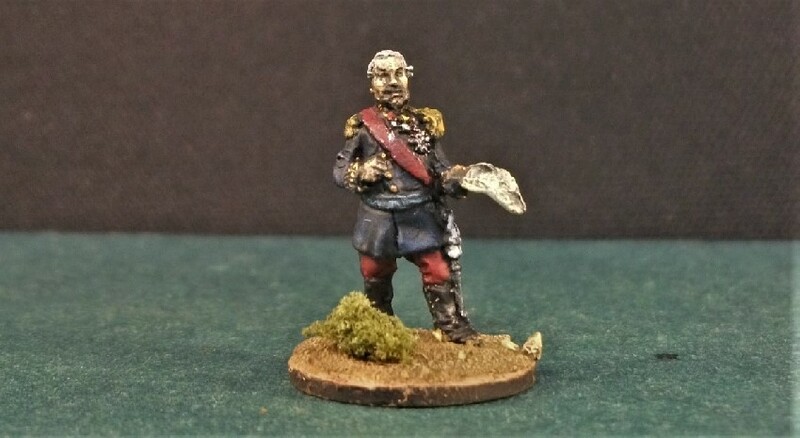 Success at the battles of Alma and Inkerman led to his promotion to Field Marshal, but as the privations of the Crimean winter took its toll on his men, Raglan began to receive criticism in the press, although whether it was entirely fair is debatable. 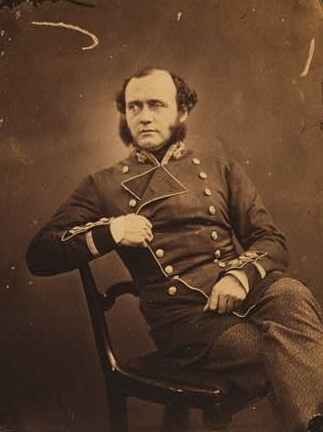 A poorly executed failed assault on the defences of Sevastopol piled the pressure on the commander and, being weakened by dysentery and a depressive illness, Raglan died whilst still on campaign in June 1855. 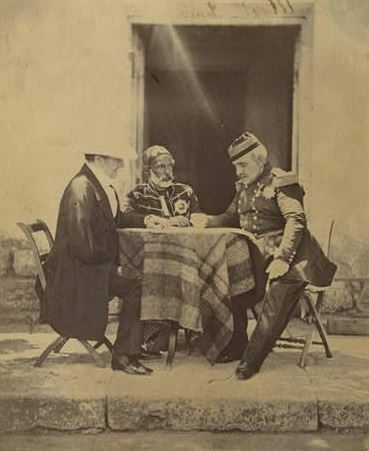 Raglan (left) in conference with Turkish Field Marshal Omar Pasha (centre) and French C-in-C, Marshal Pélissier. With both of Henry Bentinck’s brothers being generals, and his father a Major-General, senior command in the army was virtually a family business. 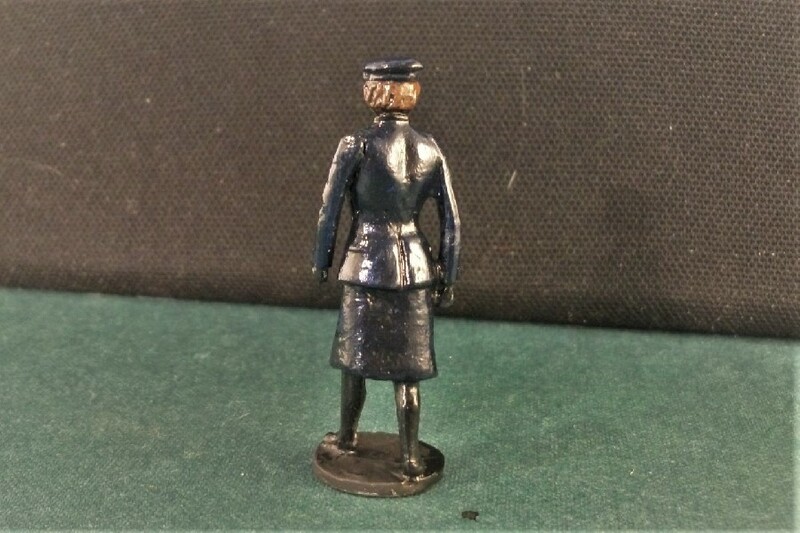 Bentinck began his army service as an ensign in the Coldstream Guards and by 1841, he was an aide-de-camp to Queen Victoria and a brevet colonel. Fenton’s haughty portrait of Bentinck, his cocked hat visible on the table. By the time Bentinck landed in the Crimea with his regiment, he was a Major-General. 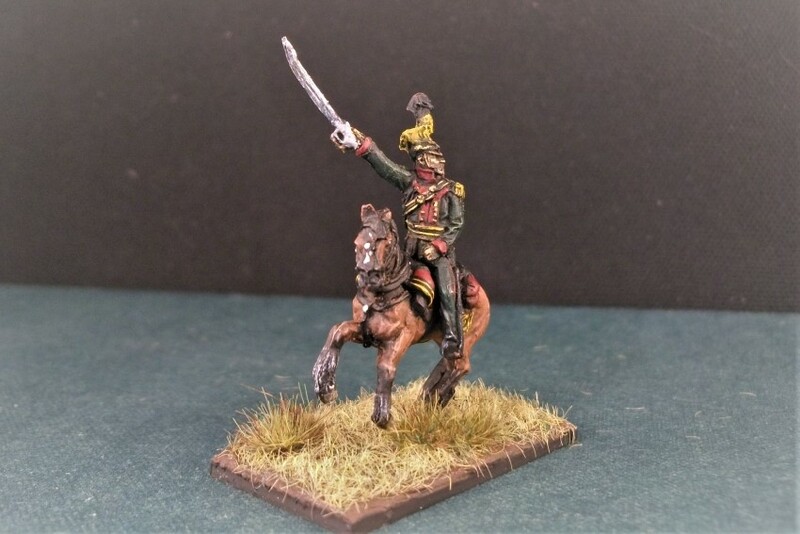 He took part in the battles of Alma, Balaclava and Inkerman, being badly wounded in the arm in the latter. 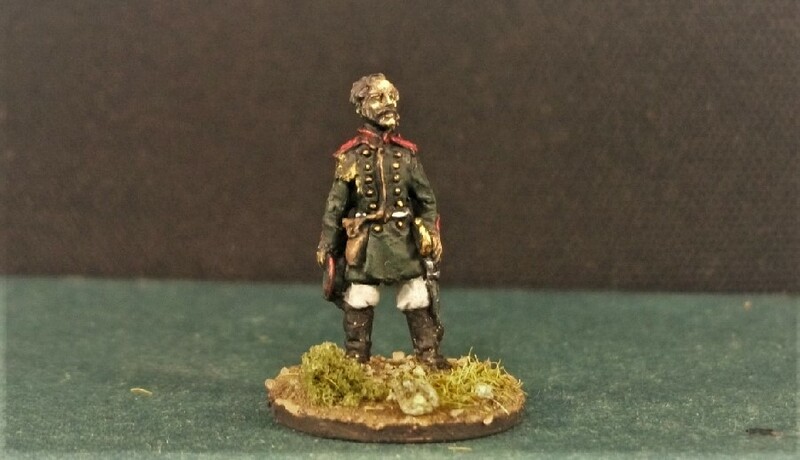 Despite the wound, he continued to serve in the siege of Sevastopol. 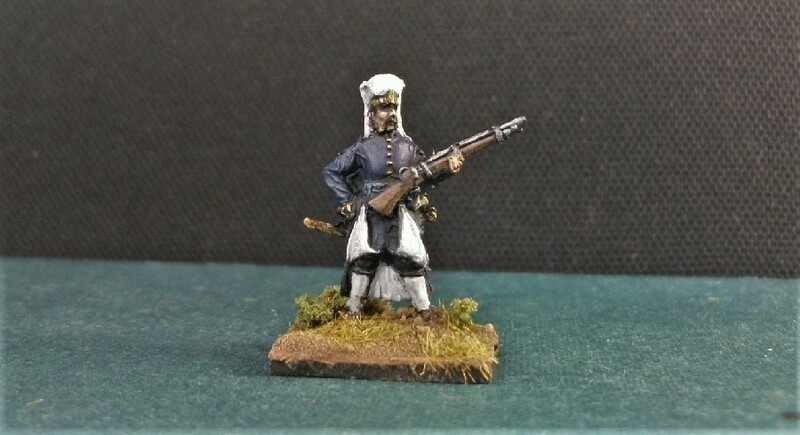 On his return from the Crimea, he was created a K.C.B. and promoted to the rank of General. Bentinck died in 1875. 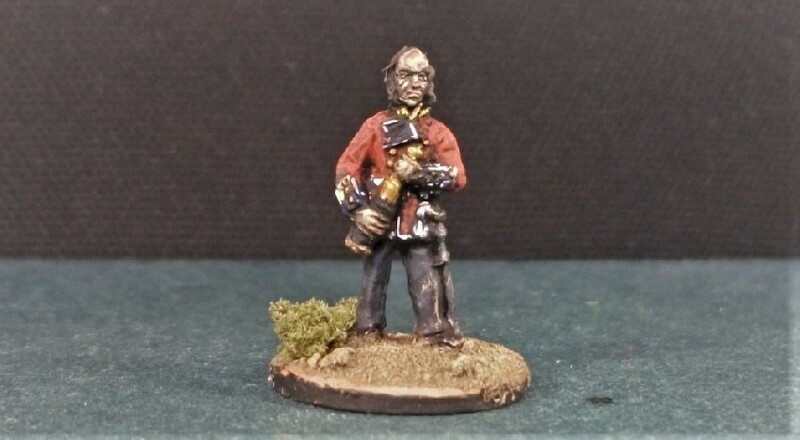 The fourth son of an admiral, as with most of the generals featured in my British personalities series, Windham began his career in a prestigious guards regiment; the Coldstreams. 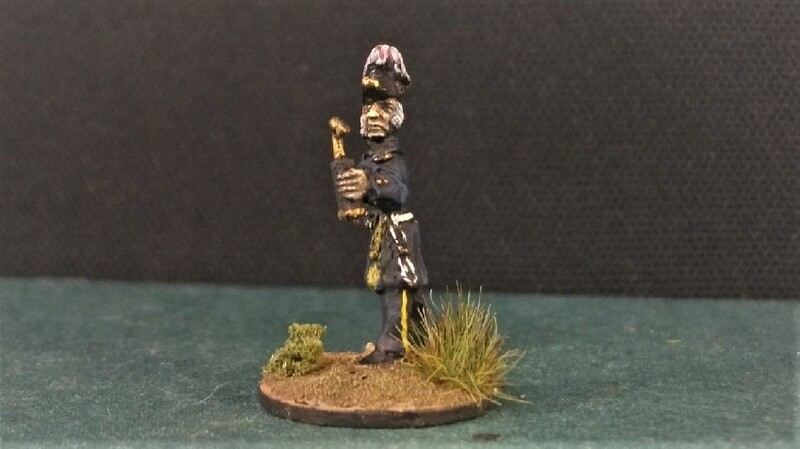 From the rank of Ensign, he went on to purchase a series of promotions throughout the 1830s and 1840s. Roger Fenton’s sensitive portrait of Charles Windham. He is depicted wearing a long scarlet coat. 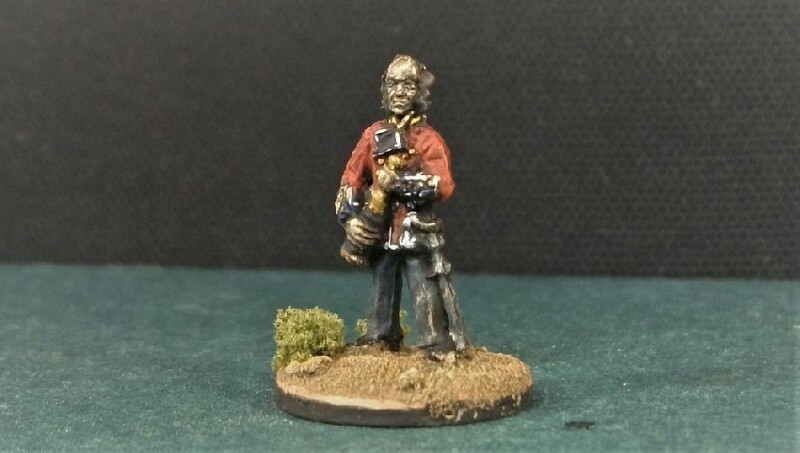 His light, patterned trousers appear distinctly non-regulation and I’ve painted them a generic light grey on my figure. 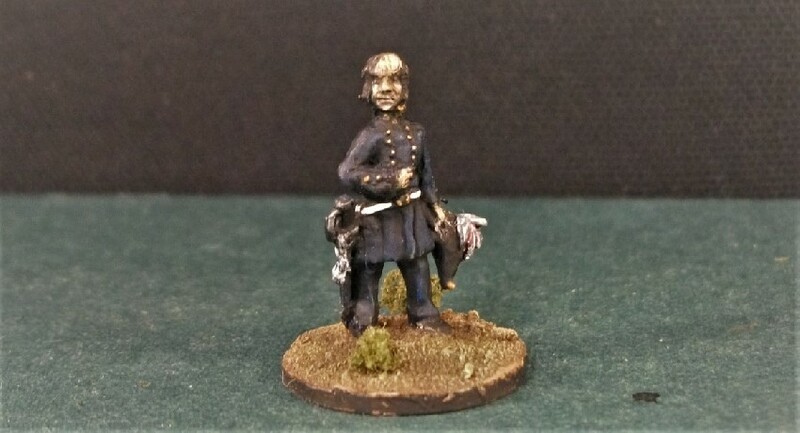 After service in Canada, Windham returned to England in 1842 where he remained until the outbreak of the Crimean War. 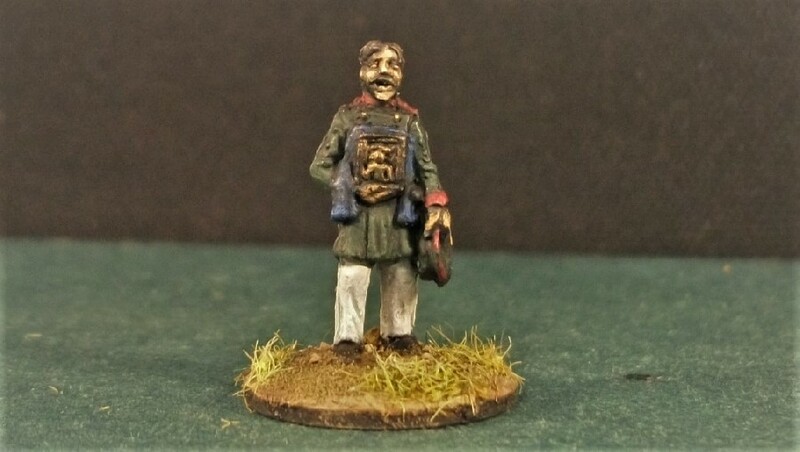 Achieving his colonelcy in June 1854, he was then appointed Assistant Quartermaster General of the 4th Division for the campaign. He soon became renowned for making clear his stern criticism of the poor military leadership of the British army at this time. At Sevastopol, he was given command of the main British attack on the Great Redan. 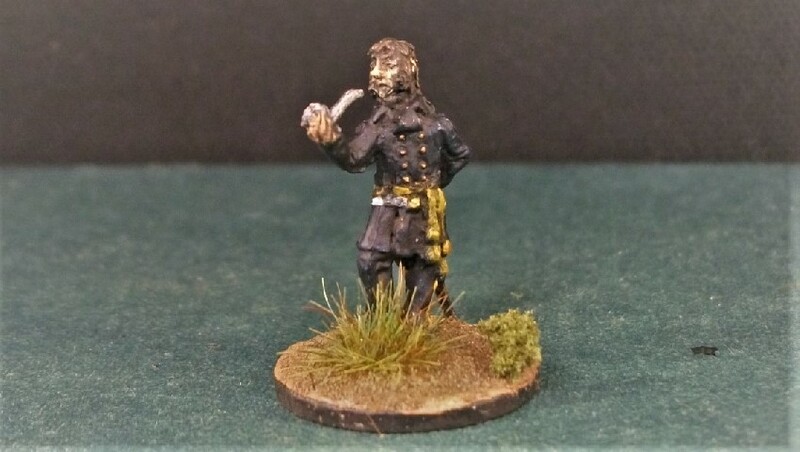 The result was a failure in which he personally rode back to beg for more reinforcements to continue the assault which had achieved its objective but was ill-equipped to hold it. 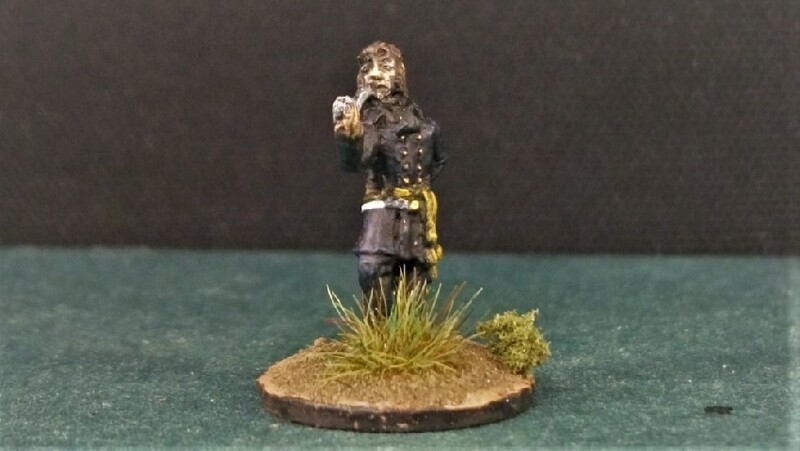 Windham received criticism from soldiers in his command but was made a popular hero by William Russell, the Times War Correspondent, who declared that Windham’s gallant conduct had saved “the honour of the army”. 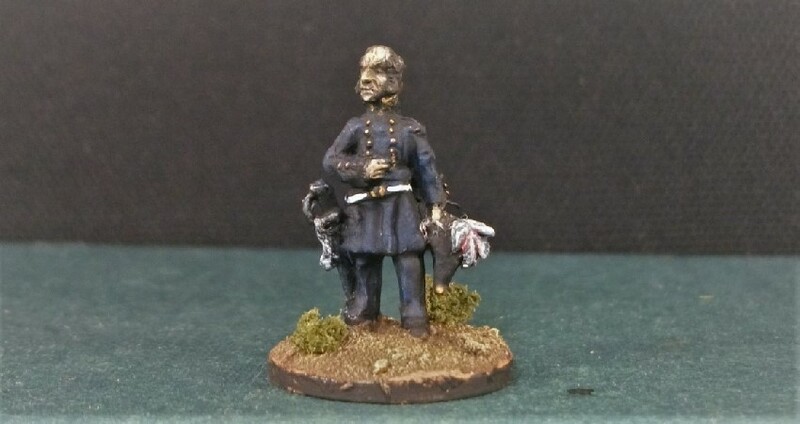 Windham’s career continued to be dogged by controversy and mixed opinions as he served in the Indian Mutiny and in Canada until he eventually died while convalescing in Florida in 1870. *Windham published a detailed diary of his experiences in the Crimean war, which the journalist Russell wrote an introduction to. An online copy is accessible from the Internet Archive here. The son of an M.P., James Estcourt’s first appointment in the army was as an Ensign in the 44th Regiment. Transferring to the 43rd Regiment, Estcourt served in Gibraltar and later on the Euphrates Valley Expedition. His services on this journey of science and exploration led to his promotion to Lt-Colonel. 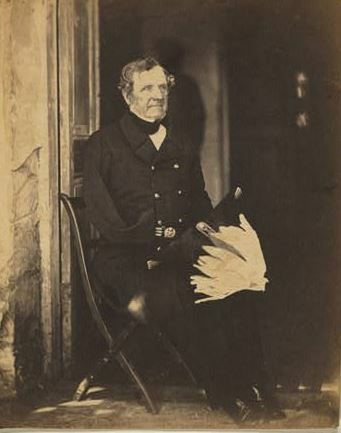 Estcourt was photographed by Fenton a short time prior to his untimely death in the Crimea. Successful service on a boundary commission in Canada and a friendship with Lord Raglan helped Estcourt, now a Brigadier-General, to be appointed Adjutant General for the campaign. However, together with General Airey, he was criticised by a press who considered them both responsible for the winter privations and terrible suffering of the troops. Stoutly defended by Raglan, Estcourt was appointed Major-General in December 1854, despite the ongoing criticism. Ironically, he fell victim to the same insanitary conditions for which he was being held by some to be responsible and succumbed to cholera in June 1855. Sir Henry William Barnard obtained a commission in the 1st Foot Guards in 1814. 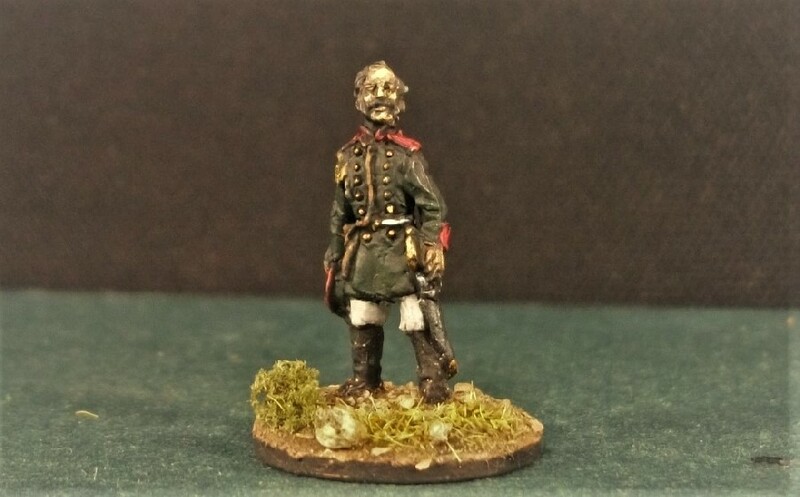 A newly made Major-General, Barnard landed in the Crimea in 1854, in command of a brigade in the 3rd division of the army, with which he was present during the winter of 1854–5. 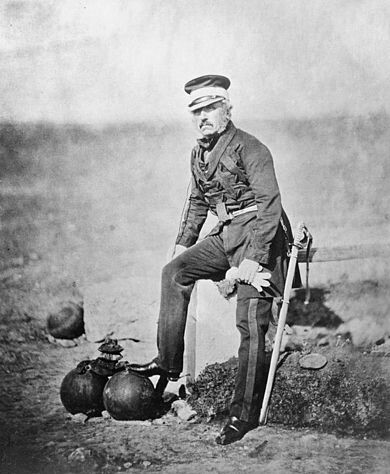 Fenton’s compelling photograph of Barnard with his foot on a shell, a stance imitated by Strelets. Through their figure, Strelets have nicely referenced Roger Fenton’s above photograph of General Barnard posing with a foot on a shell. 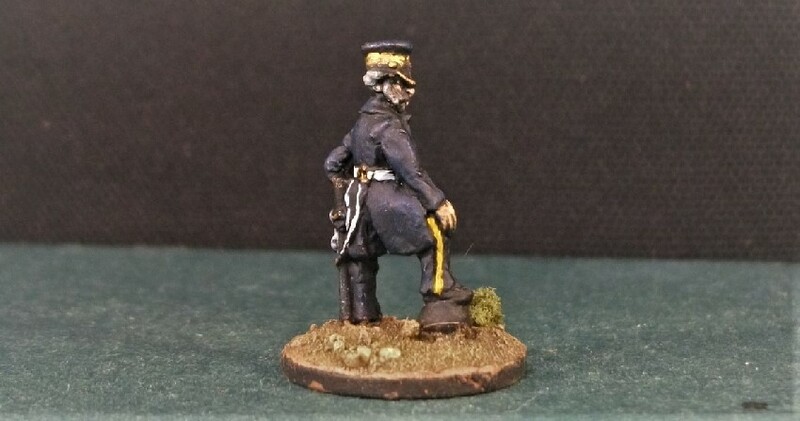 Whether or not the pose was deliberately made at Fenton’s request, by delicately resting his boot on the shell, the stance nicely suggests something of the violence and danger at the same time as the fragility of the combatants. 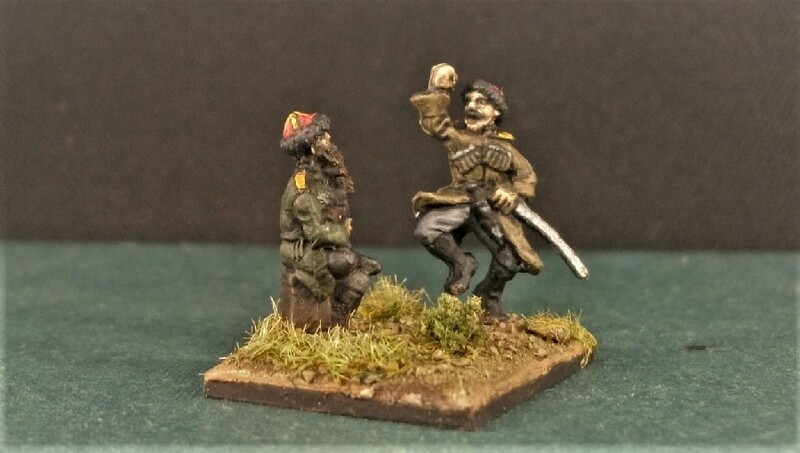 It’s just one of the postures that Strelets have employed in their Crimean range that is really pleasing to me, painting becomes the act of bringing to life a brief moment from over 150 years ago. 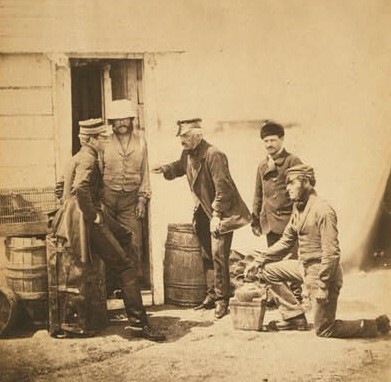 When former chief-of-staff General Simpson succeeded to Commander-in-Chief, Barnard in turn became his chief-of-staff, a position he held at the fall of Sevastopol in September 1855. He later succeeded to the command of the 2nd Division. 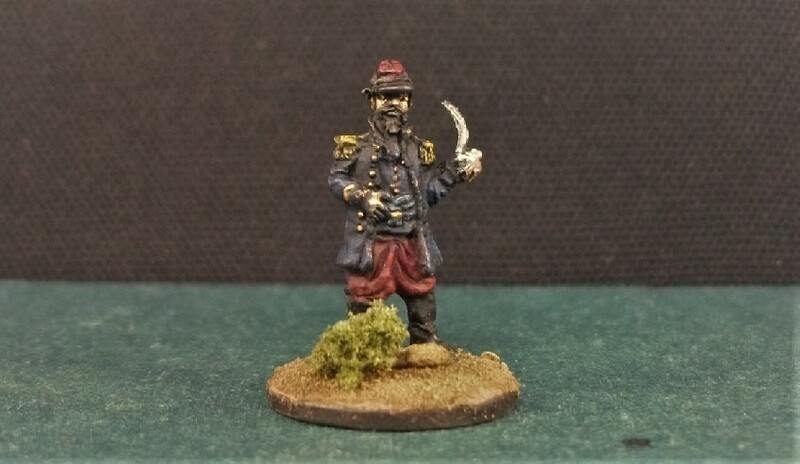 In 1857, Barnard took an active command in the Indian Mutiny and won the crucial battle of Badli-ki-Serai but died of cholera on 5 July 1857, eleven weeks before the fall of Delhi to the British. Another Fenton photograph of Barnard. He is shown ‘in a conference with his servants’. 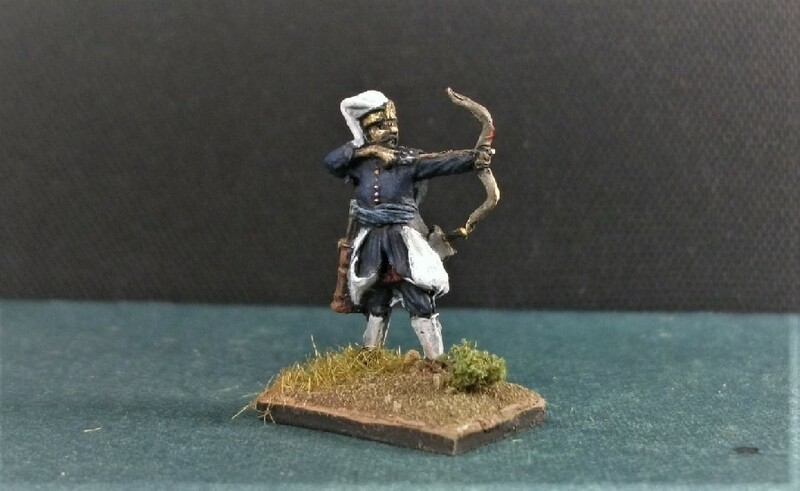 Having spent some time building up the artillery arm of my Ottoman Turk army, I’ve been recently turning my attention to the infantry; namely the famous elite foot soldiers of the Sultan known as the Janissaries. 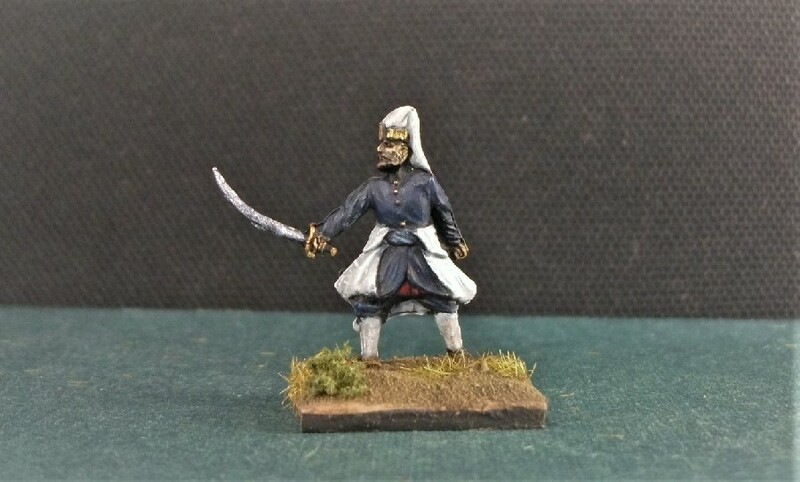 The three Janissary ocak themselves consisted of a total 196 orta regiments split between them with the Cemaat having the lion’s share of these. 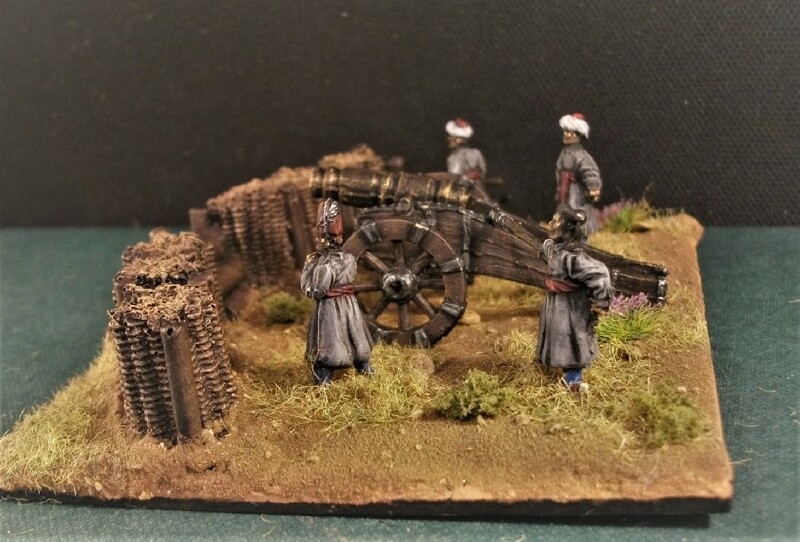 It is my intention to use the RedBox Janissary box to paint three of these ortas, representing one from each of the ocak divisions. My first group of ten are from the Cemaat ocak. 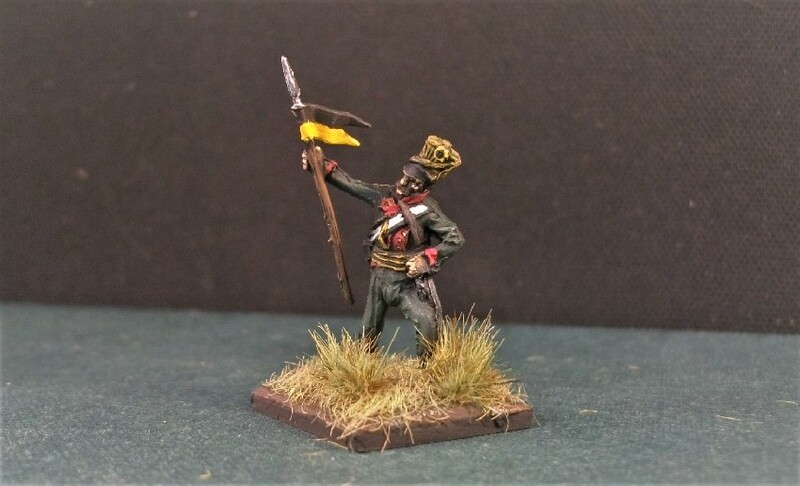 Specifically, the 73rd Orta known as the Turnacis (Crane Keepers). 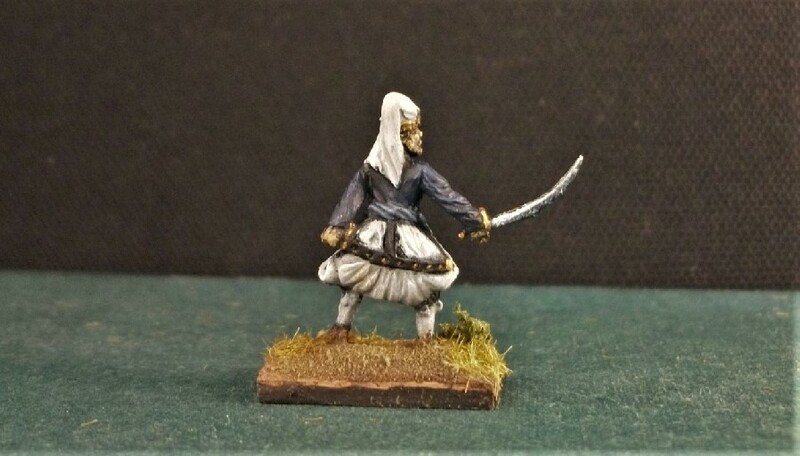 The Janissary ortas were known by peculiar names which indicated something of their origins or duties. 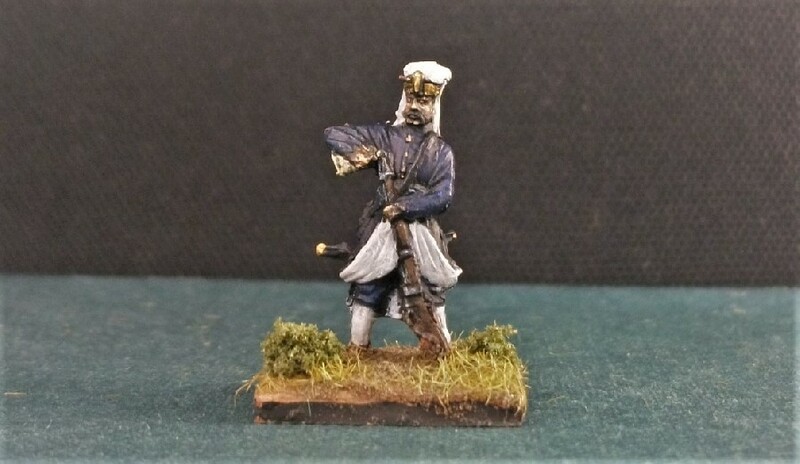 The 73rd Orta got their name Turnacis from their origins based within the Sultan’s considerable hunting establishment (presumably Cranes being a popular game bird). “The Janissaries were charged with looking after the training and the welfare of… dogs, which were greyhounds and mastiffs. There don’t seem to have been any hunts at Topkapı [palace] itself – miniatures show deer roaming around the palace grounds. And cranes were known to have been kept there. “ from Hunting, an imperial pastime in the Ottoman – Hürriyet Daily News. Each orta had its own insignia which could even be tattooed onto the men. It’s possible that the Turnacis had an insignia related to Crane birds. Even their tents had a design specific to their orta (the 73rd having a white and yellow band at the top of theirs). But what I really don’t know is exactly what they would have looked like. 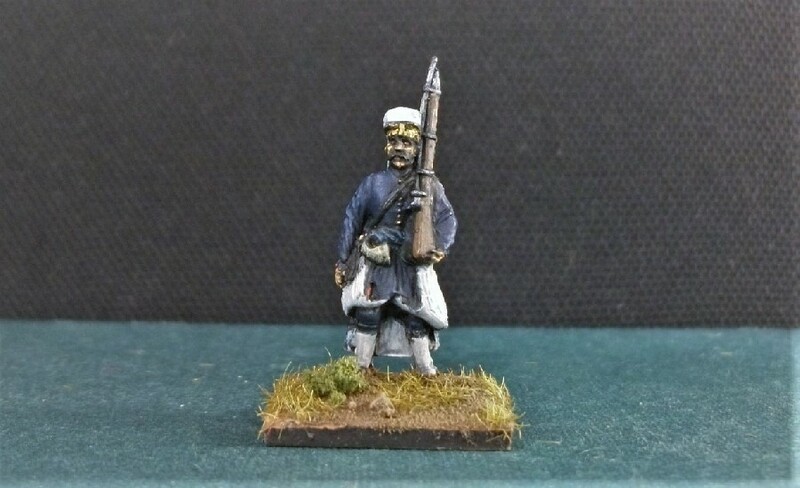 Having done some research, including my Osprey ‘Elite Series’ on the Janissaries, I’m still none the wiser as to the colours of the clothing used by my troops. Some things were common, such as the distinctive bork white felt hat. The large woollen dolama coat was apparently very waterproof, surprisingly light, and was commonly tucked under the sash when in combat or activity to allow ease of movement. But I’m not sure if colours were specific to individual units. It’s almost certain that the Janissaries as a whole did not have a single coloured uniform. 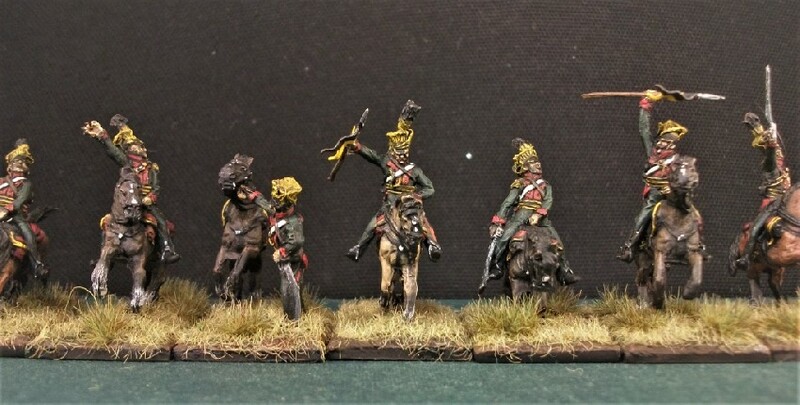 As regards individual ortas, however, proud as they were of their regimental distinctiveness, I like to think they were much more likely to adopt a colour scheme unique to their unit. 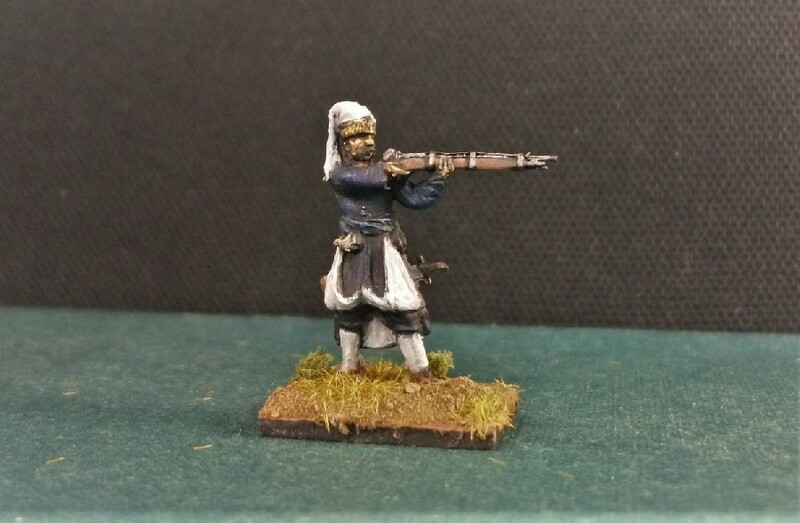 At any rate, it seems that Janissaries are regularly depicted by both artists and modellers alike as having colours specific to their orta. 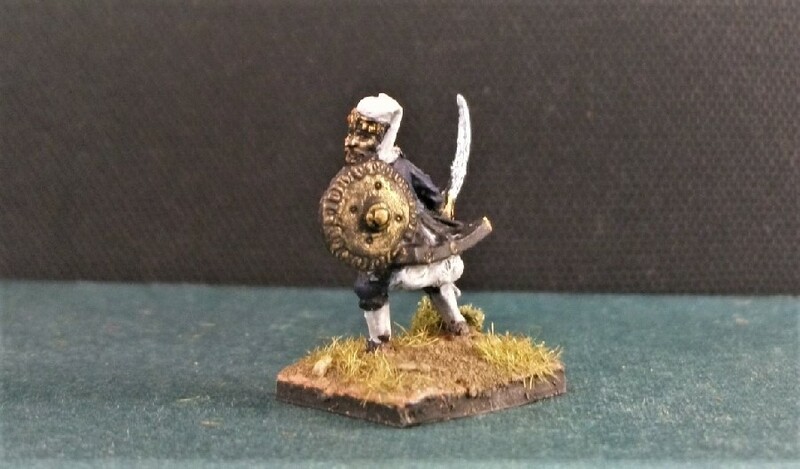 On the wargaming table, some great looking Janissary ortas (battalions) with colour schemes unique to their individual regiments. 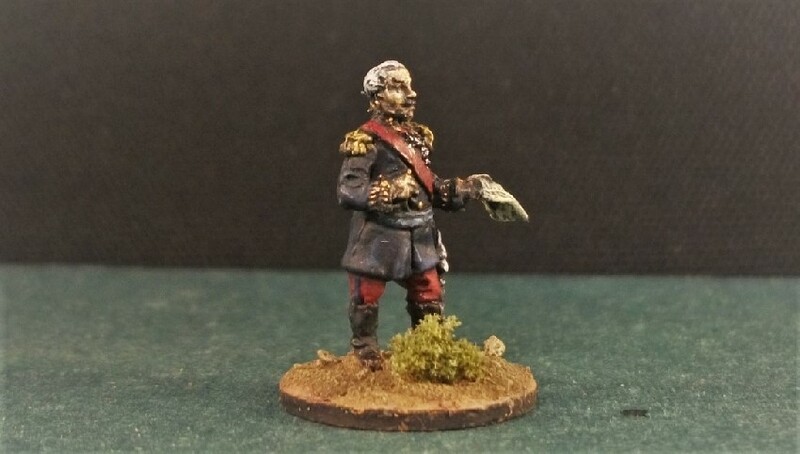 Apologies to whoever painted these figures – I can’t find your blog to credit your lovely work! 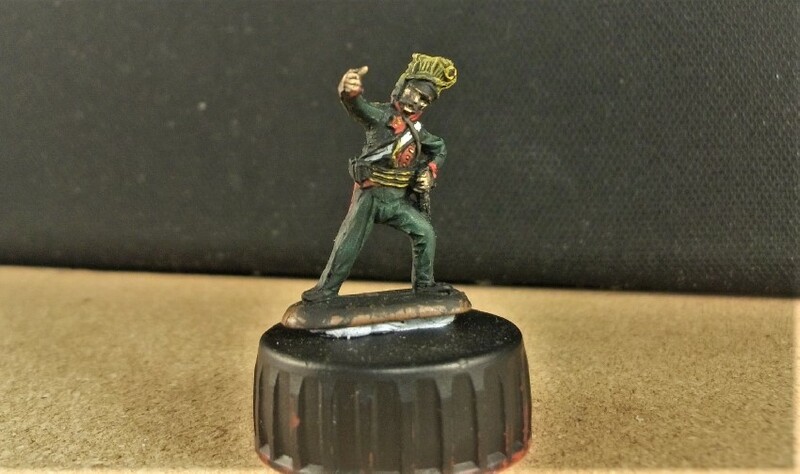 So, for enjoyment’s sake, I’m happy to go along with that idea for my Janissaries and allow my creativity free reign to colour schemes for each orta. Even this clip of a film on YouTube shows the Ottoman Janissaries wearing a single uniform colour while in combat with Peter the Great’s Russian soldiers. 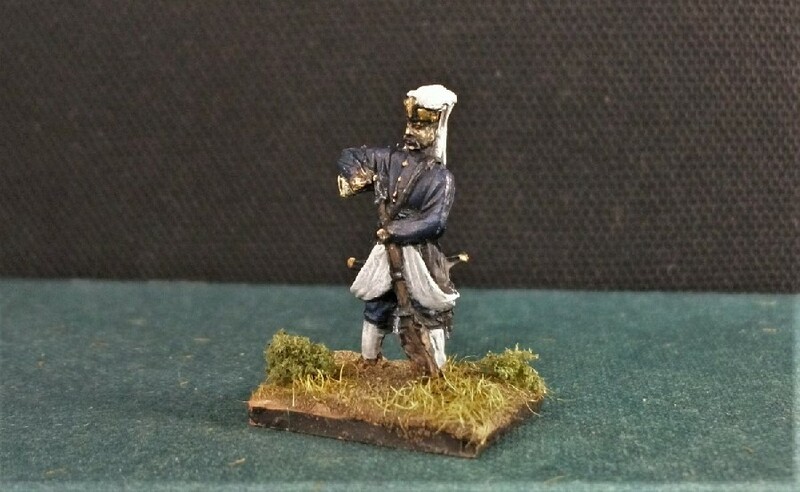 For the Crane Keepers, I’ve gone with dark blue coats and trousers with a light blue sash. The lining of the coat is white as are the famous bork hats. 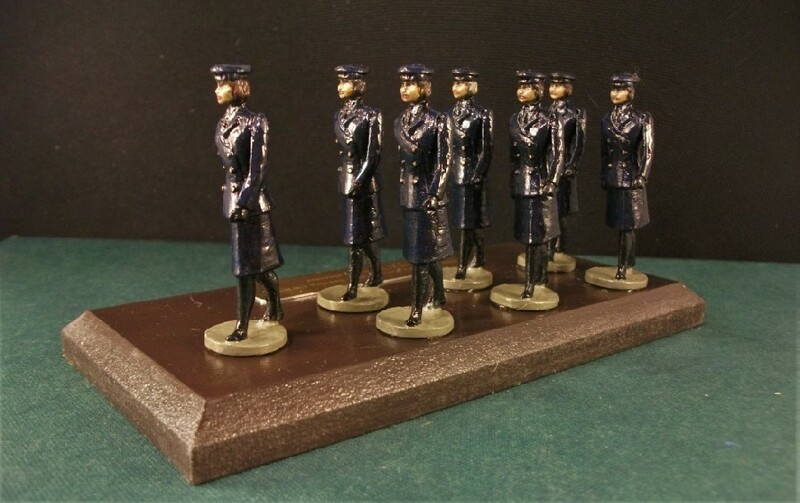 My FEMbruary submission, the M.J. Mode Wrens which I painted recently, looked like they would appreciate some kind of bespoke stand to group them all together. 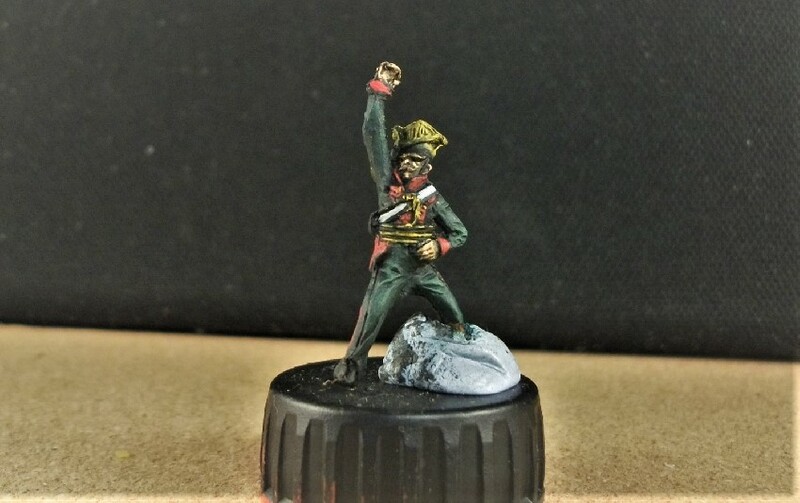 So, I found a convenient wooden base which I’ve painted and varnished up. I’ve also added a little metal engraved plaque (£1.50) from eBay which finishes off the group nicely, I think. 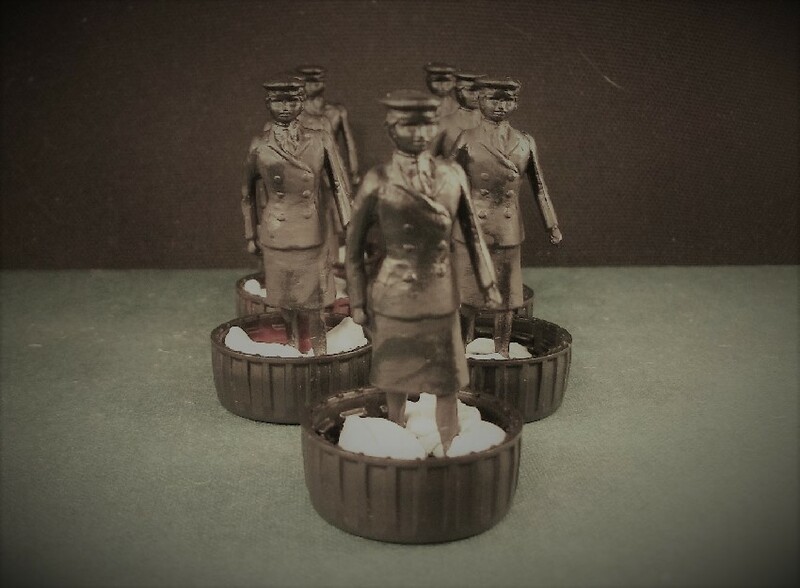 Meanwhile, Mark at Man of Tin blog has been kicking on with his own FEMbruary ladies; some Soviet female sniper command figures, and a terrific group of Land Girls, believable female miniatures all courtesy of Bad Squiddo Games. 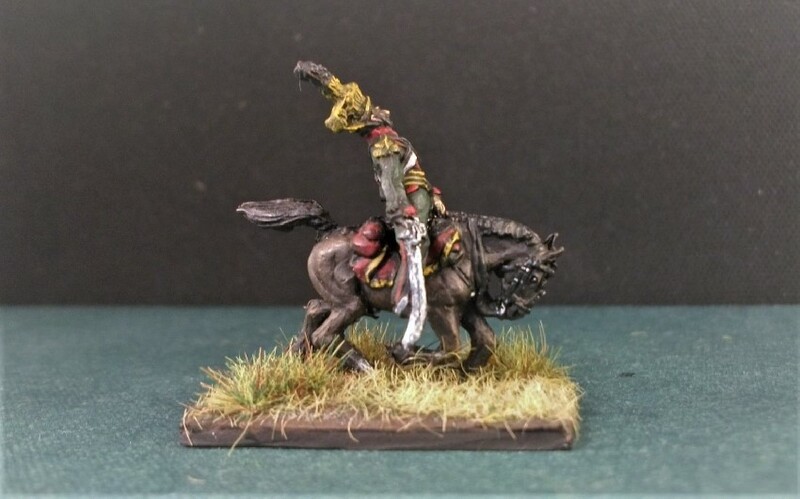 Also, Alex at Leadballoony blog has created the magnificent but ill-fated Seros the Red, Thrice Cursed of Khaine! 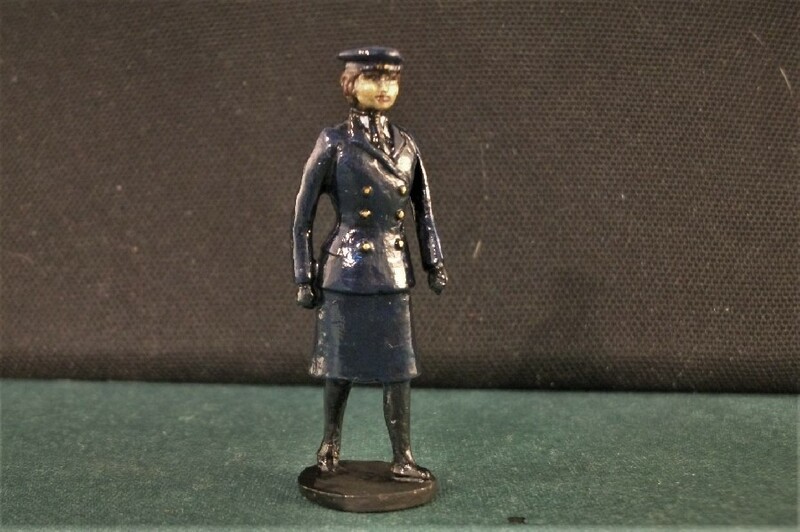 Curiously, a kitchen in Glenfield is exactly where, many decades later, I’ve been painting his Wrens figures! 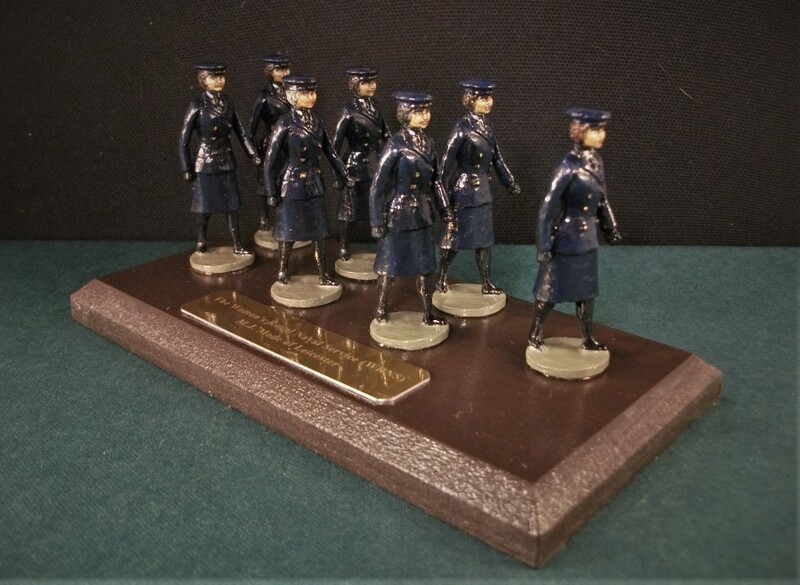 Posted from an eBay seller in Margate, these ladies have made their way home. 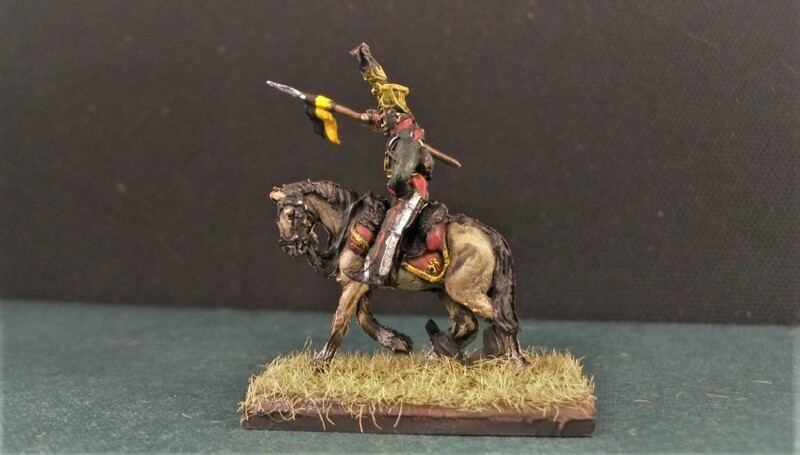 Much information on M.J. Mode I discovered over on the excellent Vintage 20Mil website which features an fabuous piece written about the history of Douglas Miniatures. 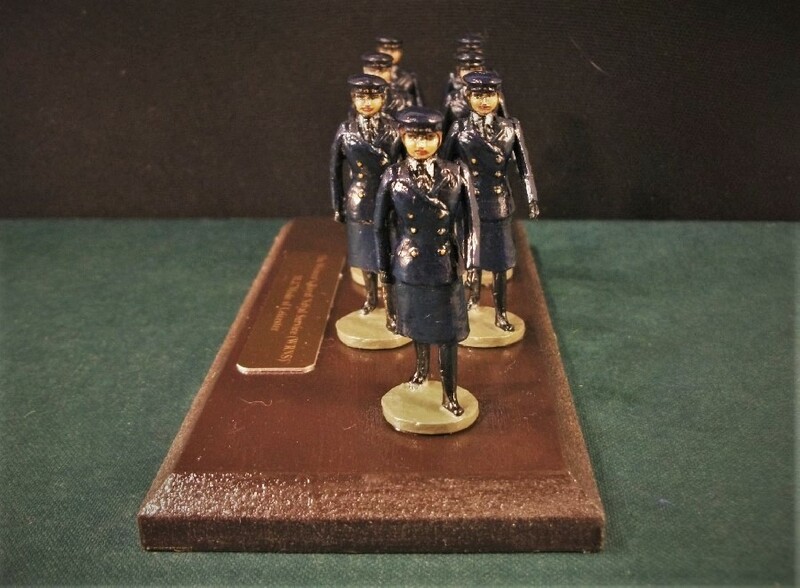 Insurance salesman John D “Jim” Johnston began making 54mm model soldiers for his own pleasure around 1965. In 1967 he met wargame enthusiast and rule writer Trevor Halsall in the Apex Craft Shop in Leicester. 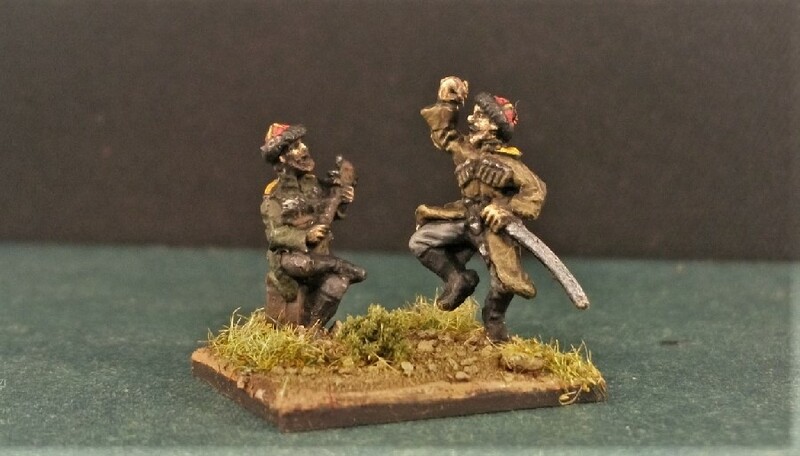 Together the two men founded the Leicester Wargame and Model Soldier Society. 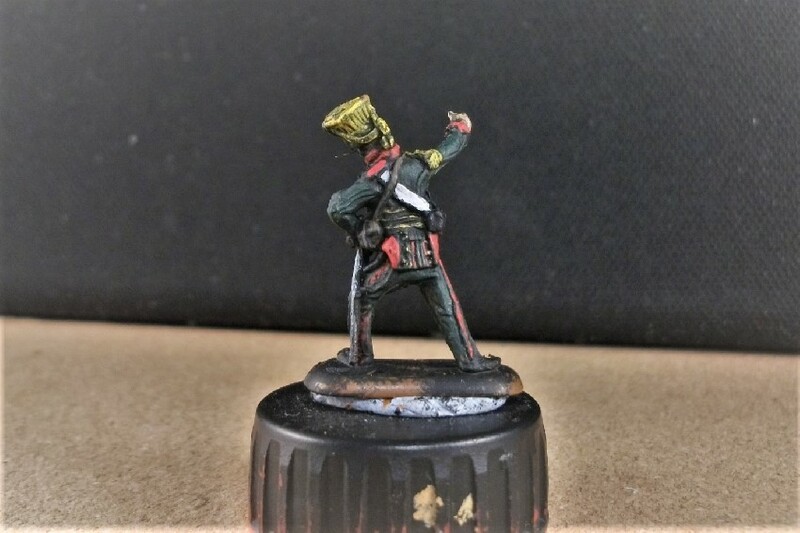 One of my M.J. Mode Wrens, gloss varnished and awaiting something to stand on. This Wren appears to be glancing distractedly off to the side. MJ Mode thrived until 1986 when Johnston was struck by another heart attack and died. He was just 48. 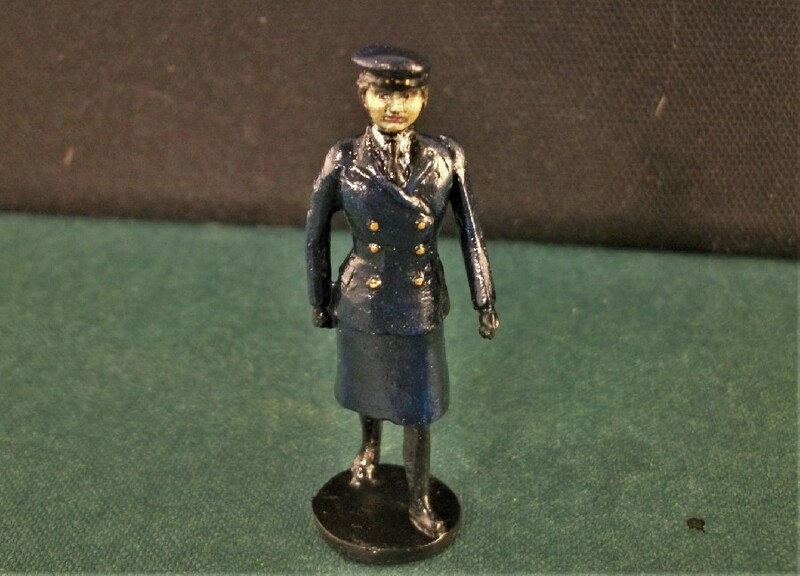 This Wren is a real blonde bombshell – well, at any rate she loads torpedo bombshells on to submarines. Jim was not very much older than I am now when he died, which is a sobering thought. 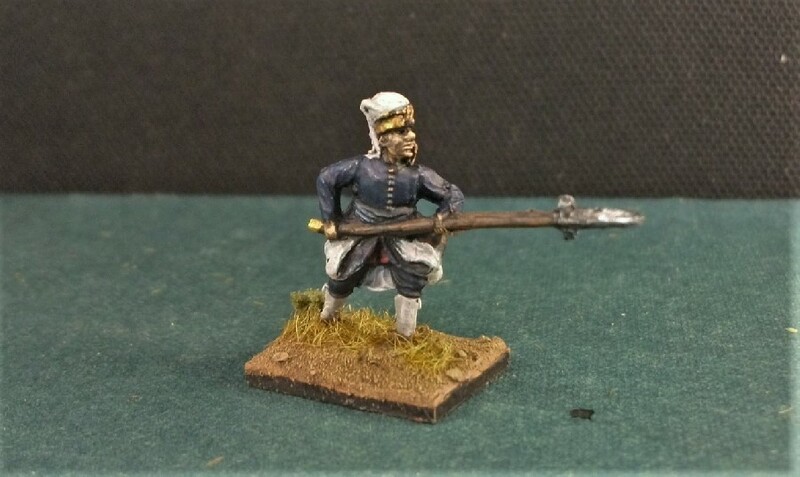 Hopefully, he (if not his painter wife Marie) would have approved of my amateurish paint-job. 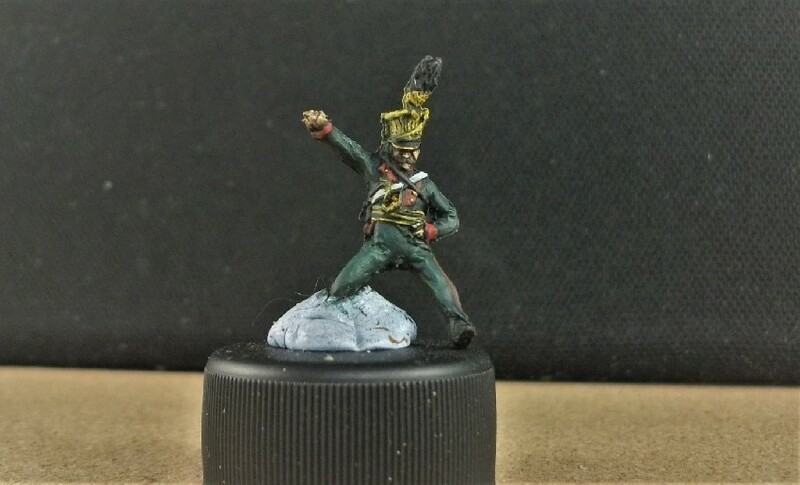 It’s not my usual painting style, (I’ve painted – not shaded – the faces for example) and I’ve been adjusting, repainting and playing about with the results as I’ve gone along. 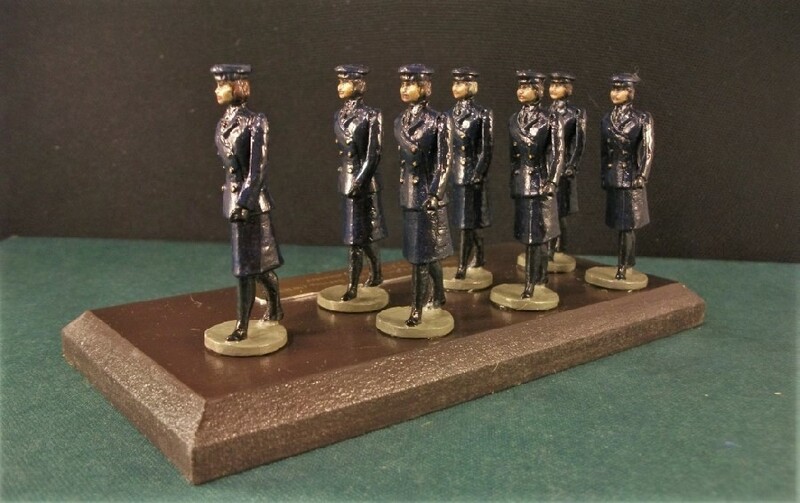 But I’m cutting myself some considerable slack in this attempt and think they look pleasing enough painted in their glossy varnish – from a distance! 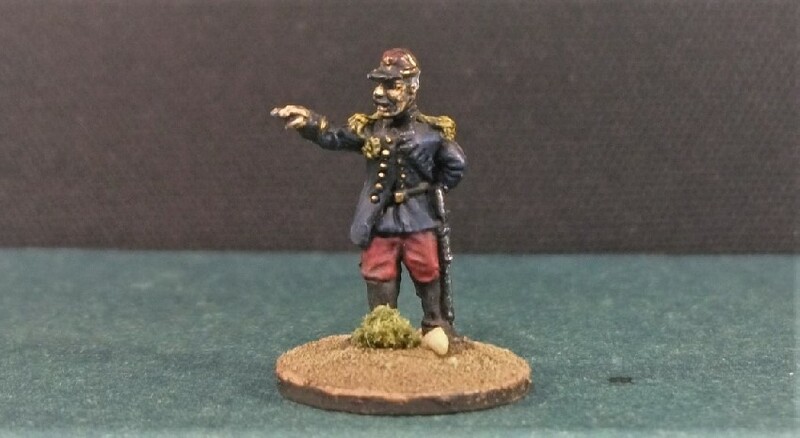 I’ve added very subtle shading and highlighting to their uniforms and the “HMS” in the centre of their caps are simply three gold dots. I particularly enjoyed how my shabby painting of the faces led to individual personalities. One looks suspiciously to her left, another has Mick Jagger-like lips (something she’d probably thank me for). Different coloured hair further adds to their individuality. I suppose this FEMbruary submission has become also a Jim Johnston tribute. 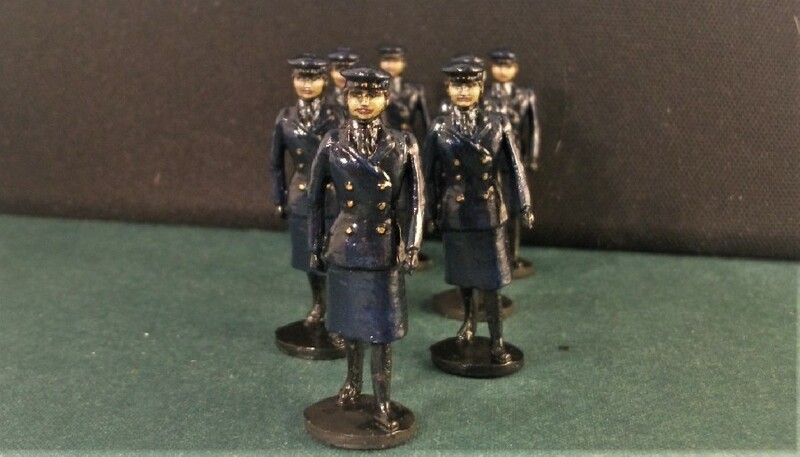 Thanks to Vintage 20mil, I now feel a real connection with these lovely old figures, unidentified as they initially were and bought on a whim from eBay. I’m not quite done with them as I’d like to base them too, an idea that I’m working on and hopefully will share in a future post. M.J. Mode; made – and painted – in Glenfield, UK! 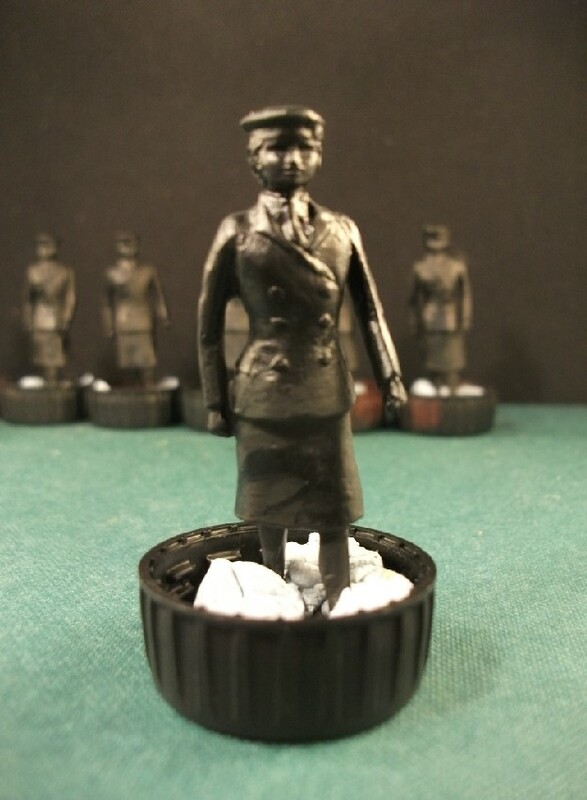 Realistically proportioned, proud and smartly dressed, I think these ladies make a worthy addition to the FEMbruary challenge but already, Imperial Rebel Ork has smashed the ball out of the park with this incredible submission – (warning – not for those with a fear of chainsaws, zombies or Volkswagon Beetles). It’s FEMbruary! 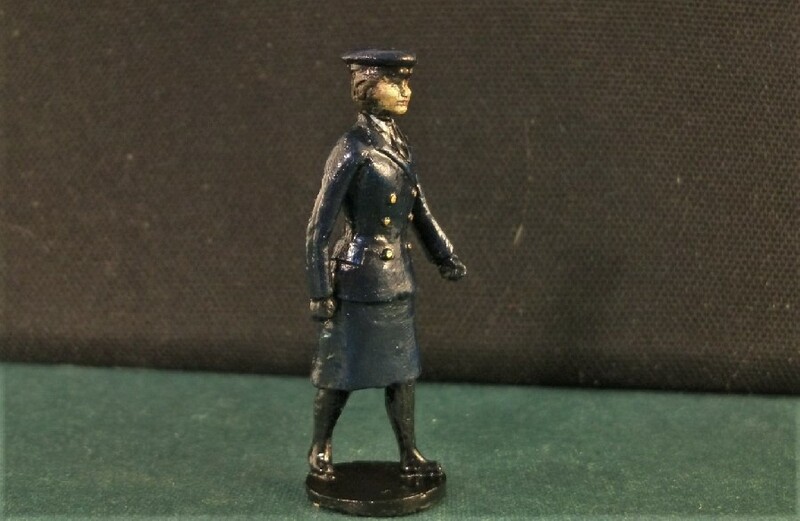 This is a great idea is from Alex over at Leadballoony who managed to inspire many of us miniature figure painters last year to consider attempting female versions. Some wonderful creations abounded. 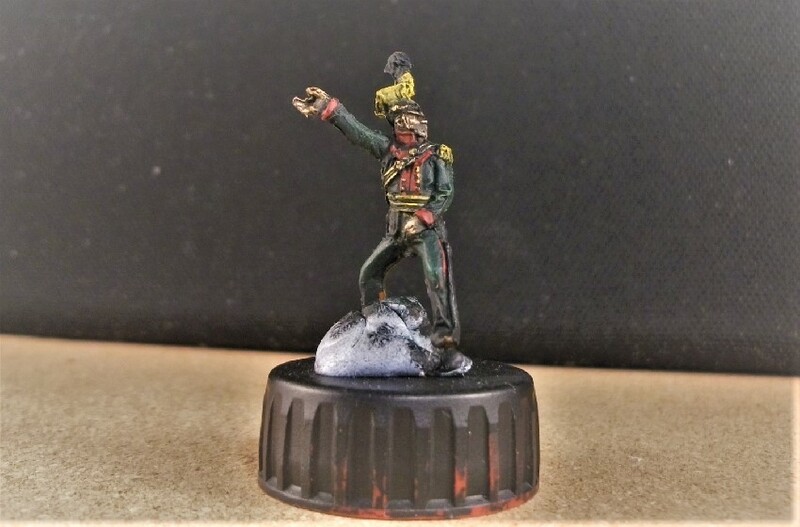 For my part last year, at the suggestion of Mark from Man of Tin Blog, I attempted a figure from the wonderful Bad Squiddo Games; Catherine the Great of Russia. 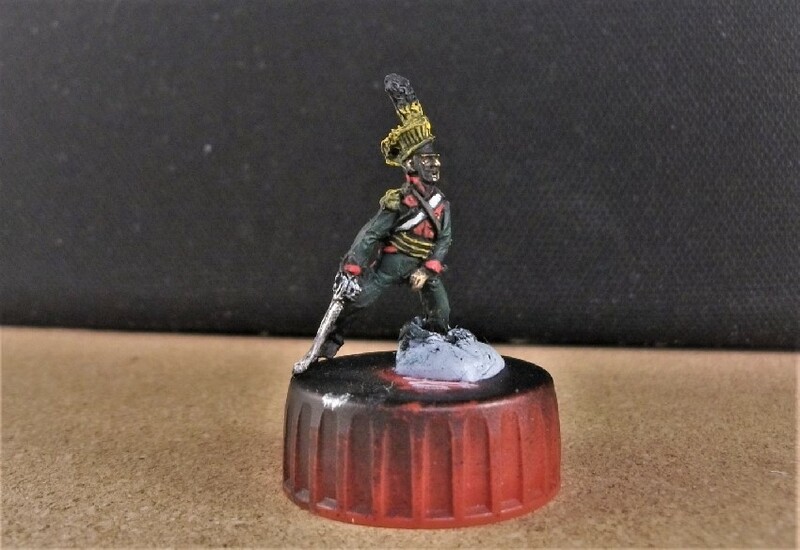 2018s FEMbruary figure – Bad Squiddo’s Catherine the Great. 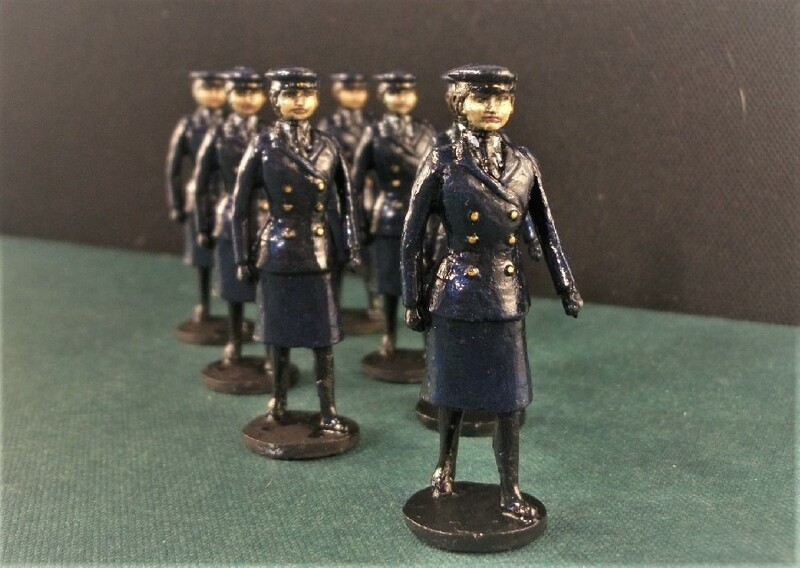 Alex is leading from the front once again with his 2019 call for Fembruary figures! 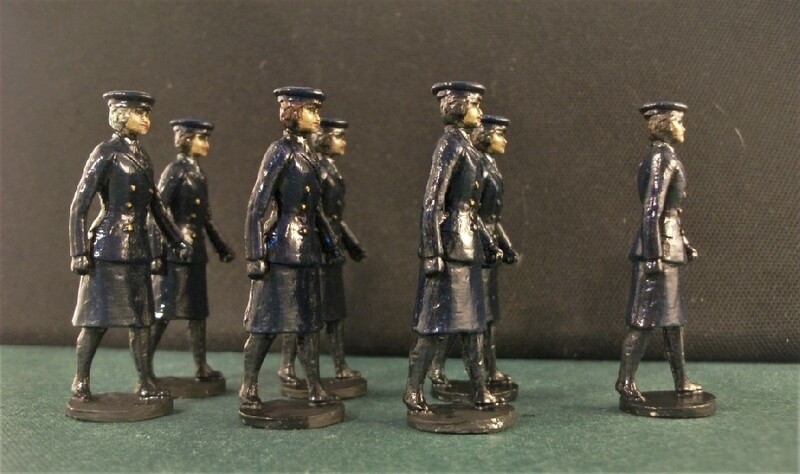 And I’m answering that call again with a group of seven 54mm-scale metal ladies marching in uniform. 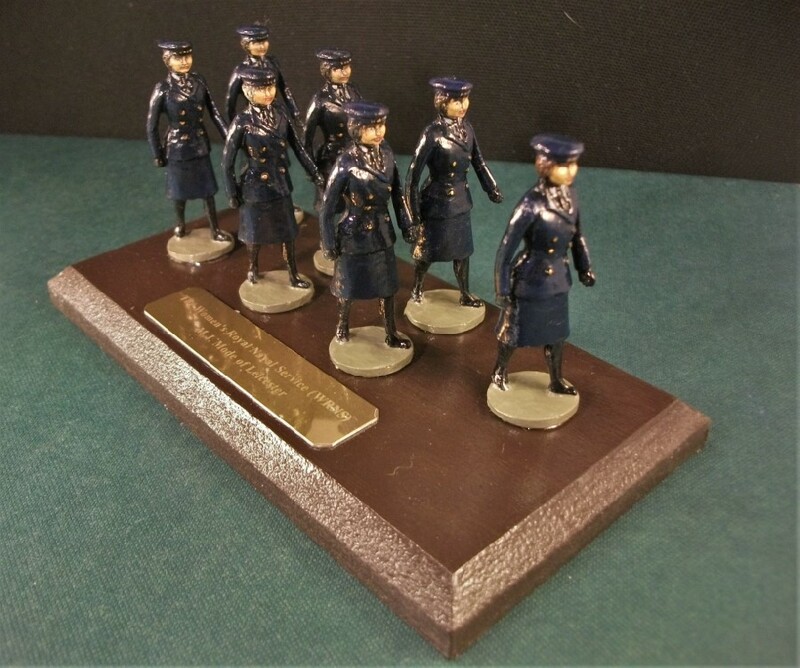 These are Wrens, that is to say members of the Women’s Royal Naval Service. I guess they are WWII-era naval personnel judging by their headgear. 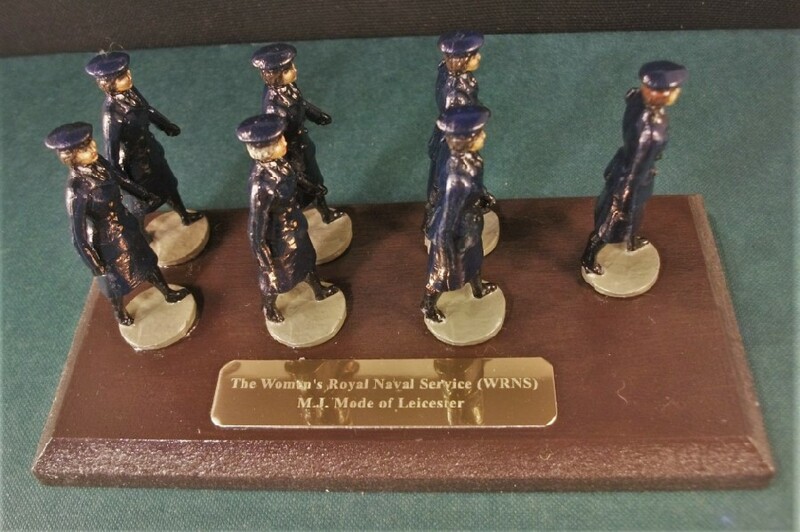 Wartime necessity gradually eroding those old, strict gender roles… The WRNS were first established in WWI and disbanded soon after its end., but WWII brought them back. 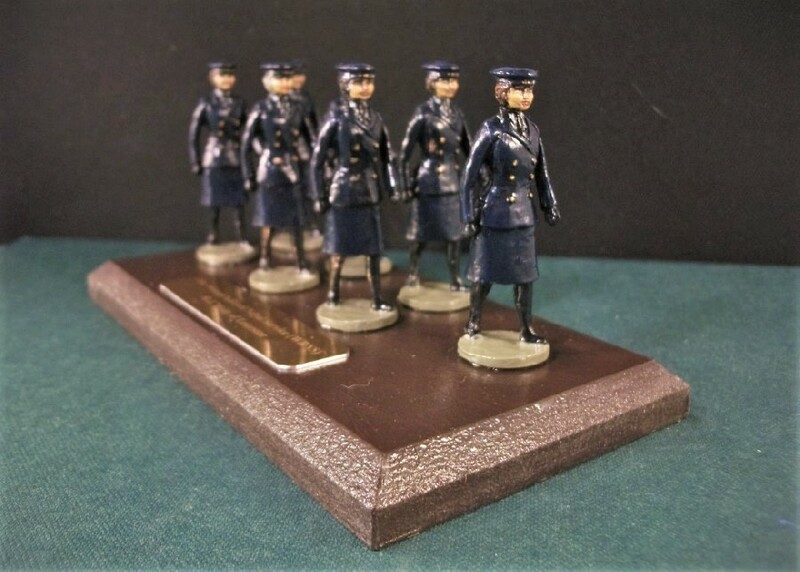 Purchased for a very reasonable bid on eBay, these female naval personnel are from an unknown manufacturer – can anyone advise (Man of Tin Mark – any ideas, fella)?! 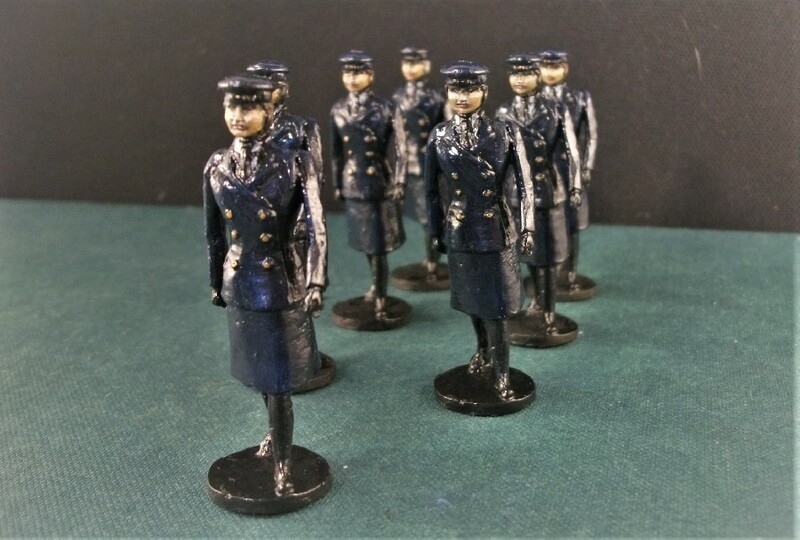 The figures were purchased on eBay unpainted. 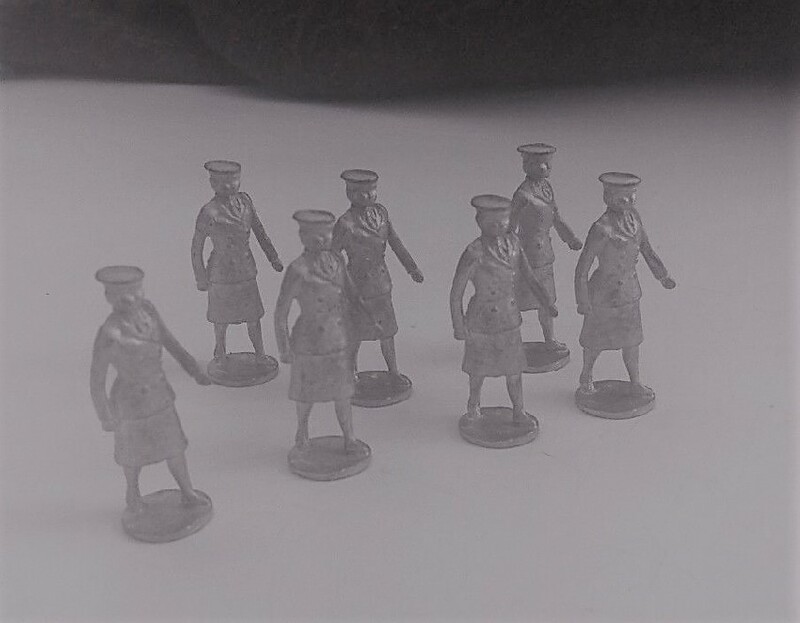 They are about 54mm high and made of metal. I’ve glued them into bottle tops with a bit of blu-tack as extra support. 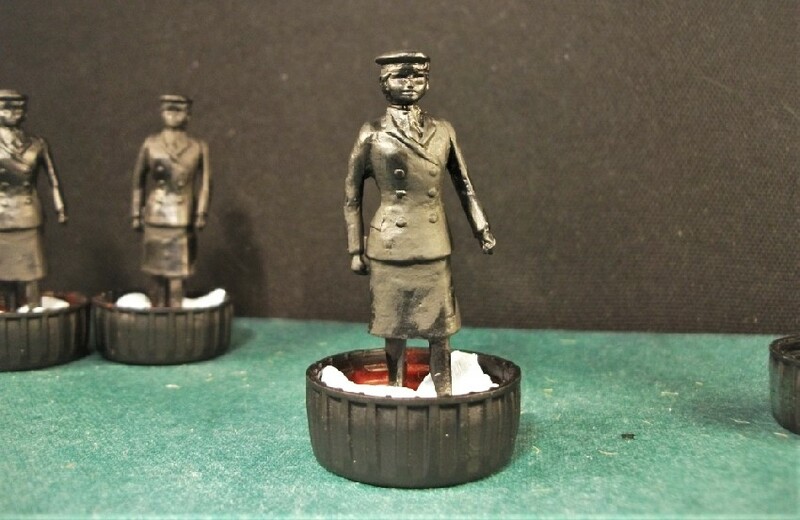 I’ve already sprayed them with black acrylic as a primer, so everything’s ready for painting. 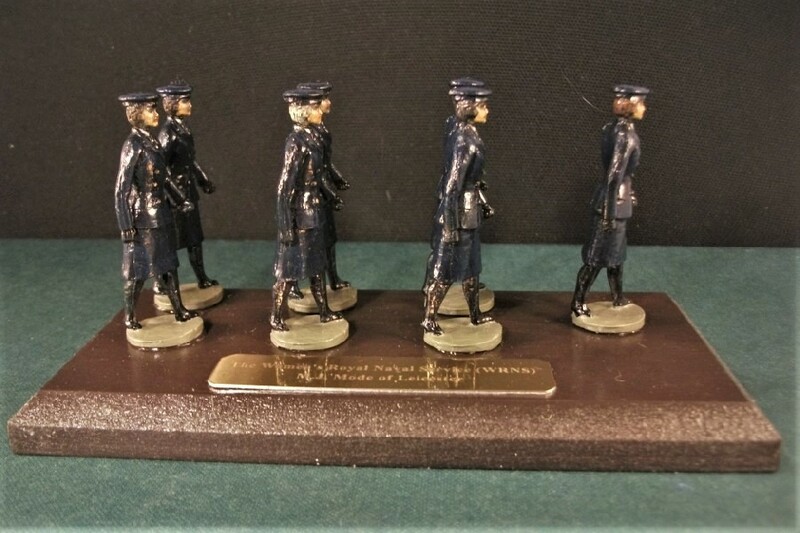 Navy girls awaiting navy paint – my Wrens on the march. 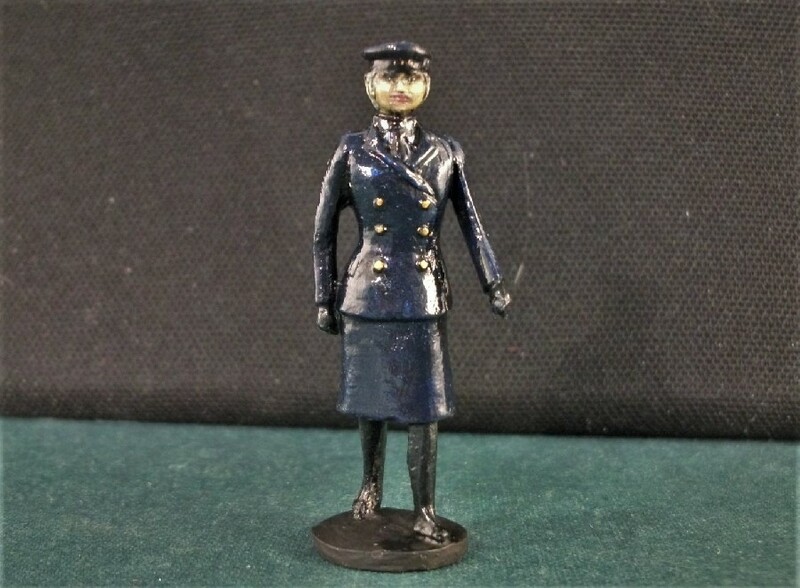 The key challenge is that the style of these figures really cry out for a classic Britains-esque paint job which, as some of you may know, is not at all my usual style. I think I’ll stick, more or less, with a version of my usual approach and just see what I’m happy with. Not the kind of thing I tend to do on Suburban Militarism, but that’s one of the things that makes them, and FEMbruary, so worthwhile. 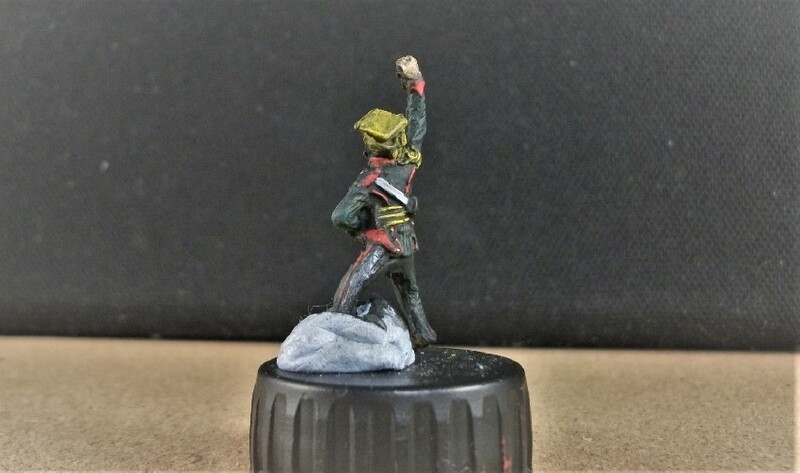 I’ll be painting some more figures from Bad Squiddo too this month which I will reveal soon. Meanwhile, Man of Tin blog has hit the ground running with his inaugeral 2019 post on his plans for FEMbruary. Bad Squiddo Land Girls, female Russian snipers and a little choice reading material for starters. You can also keep up to date with FEMbruary and its participants via Leadballoony’s blog post here! 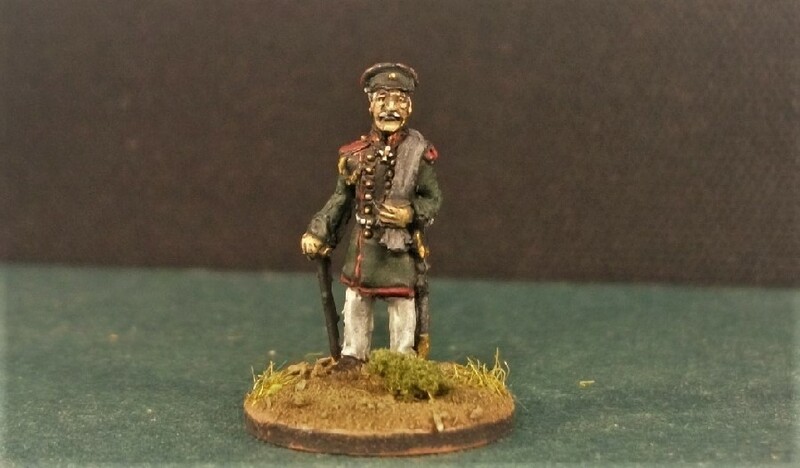 The third instalment of my Ottomania project is yet another group of artillery. 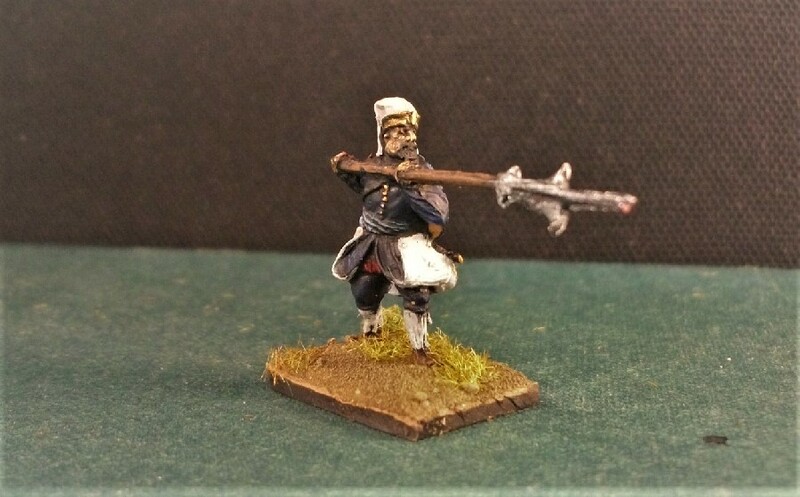 After recently painting two boxes from the 17th century, I’ve been making use of one of RedBox’s 16th century guns instead. Cannon technology changed little between the 16th and 17th centuries, so the gun crews can be placed together with no problem at all. 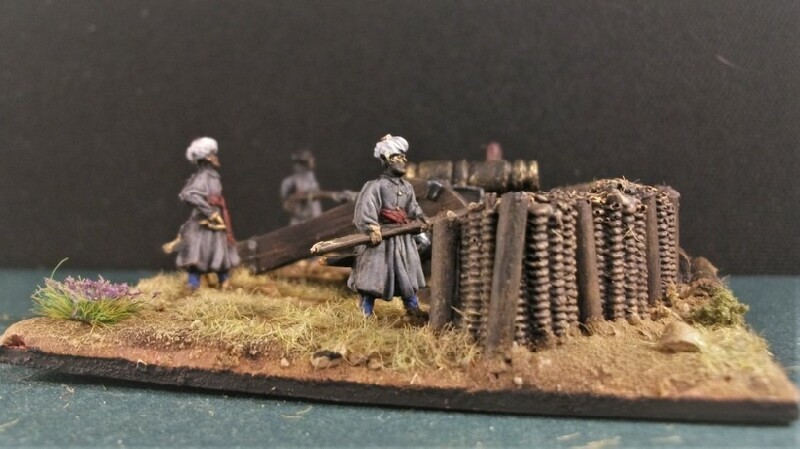 The siege cannons in the set come in a four but as I appear to have, err, lost part of a crew somehow, I’ve only attempted three of them (this at least makes things a quicker to do). 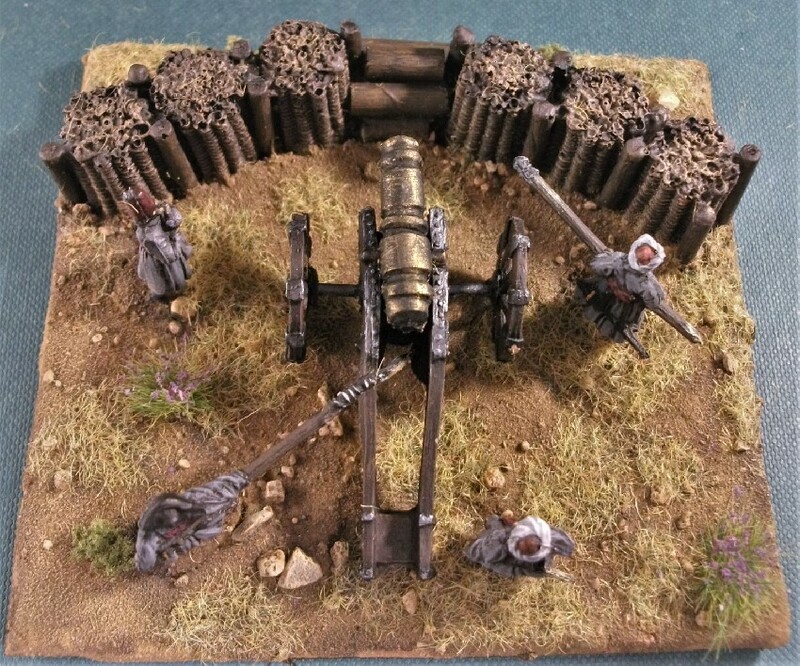 Redbox’s 16th Century siege artillery guns are certainly of the kind of large calibre which suggest they’re capable of hurling wall-breaking cannonballs. 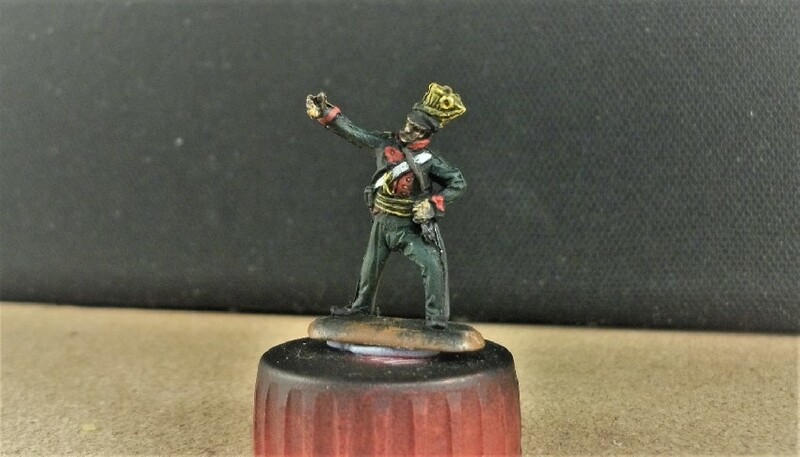 Plastic Soldier Review suggests the barrels might be a little short, a notion which is supported by the guns looking somewhat stubby. I think they’re pretty convincing siege guns nonetheless. 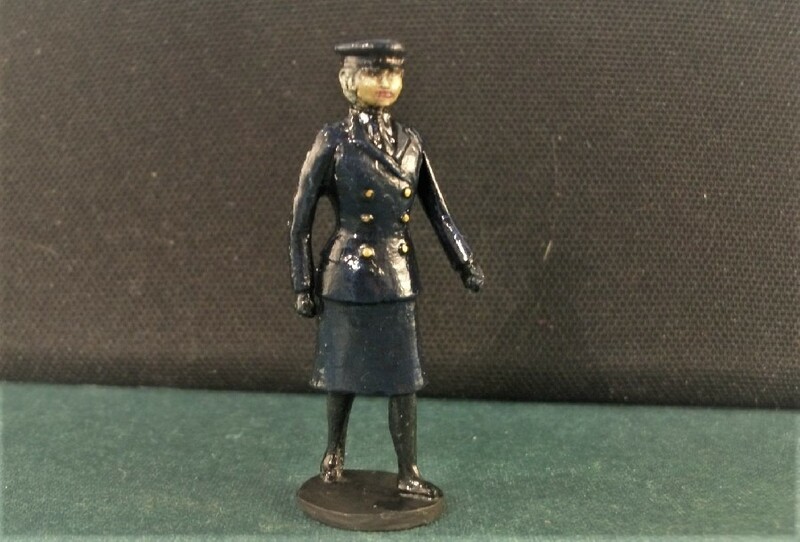 The figures are of the usual high quality and this time I’ve gone for a grey uniform, blue trousers and a red sash. 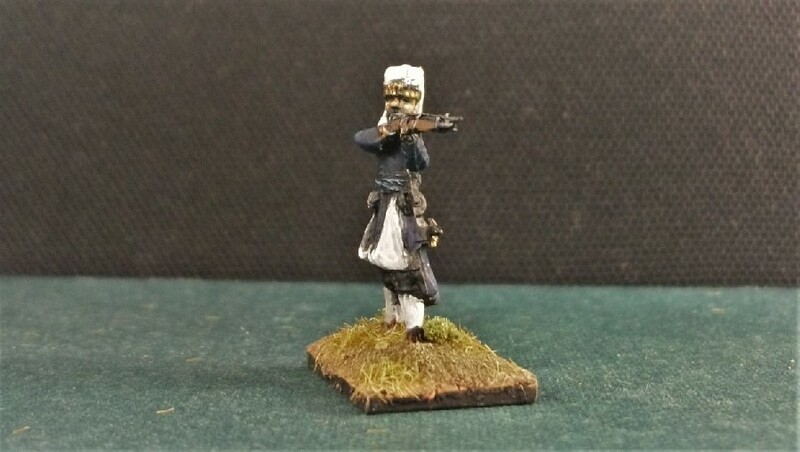 My Serbian friend from Bennos Figures Forum found some interesting information about the Turks. 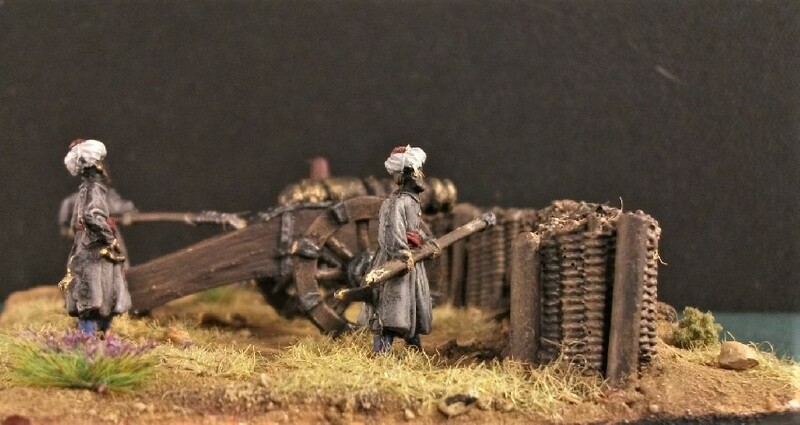 This group of siege gunners belong to the Kapikulu Corps, the Sultans’ elite of the Ottoman army which contained its own infantry, cavalry and artillery, much like Napoleon’s Imperial Guard. 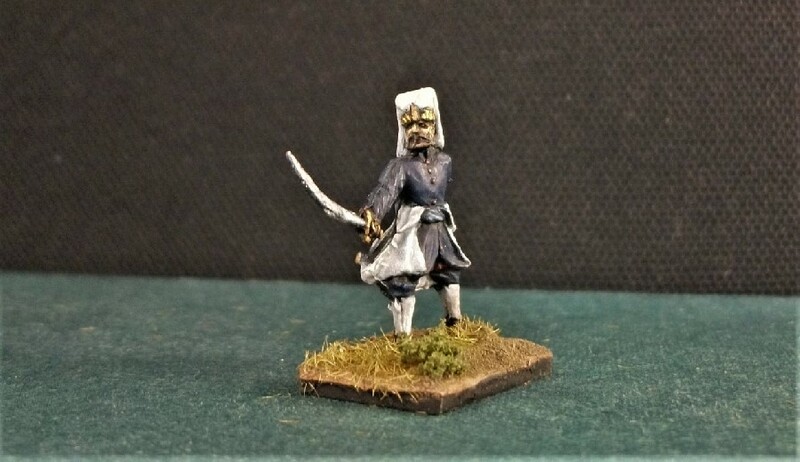 Begun in the early 14th century, the Kapikulu grew in size and Süleyman I increased them to 48,000 strong, half of which were Janissaries (elite infantry). 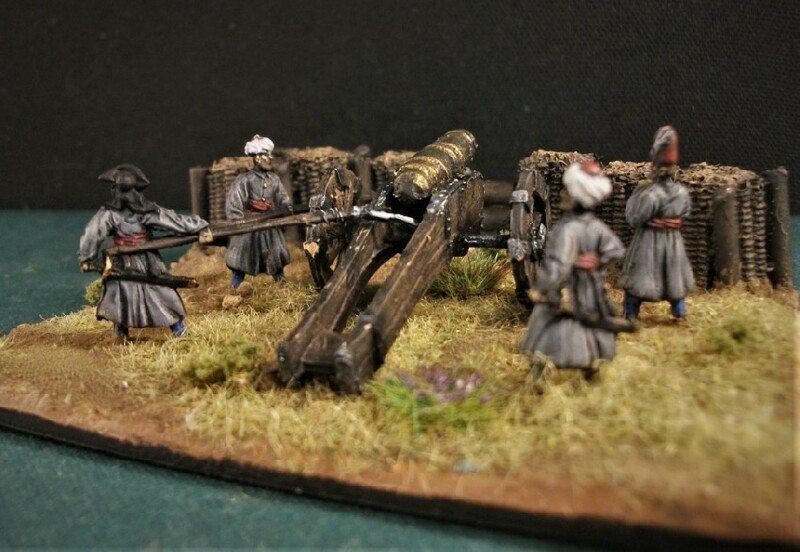 Most of the artillerymen in the Ottoman army belonged to the Topcu Ogaki Regiment of the Kapikulu Corps. 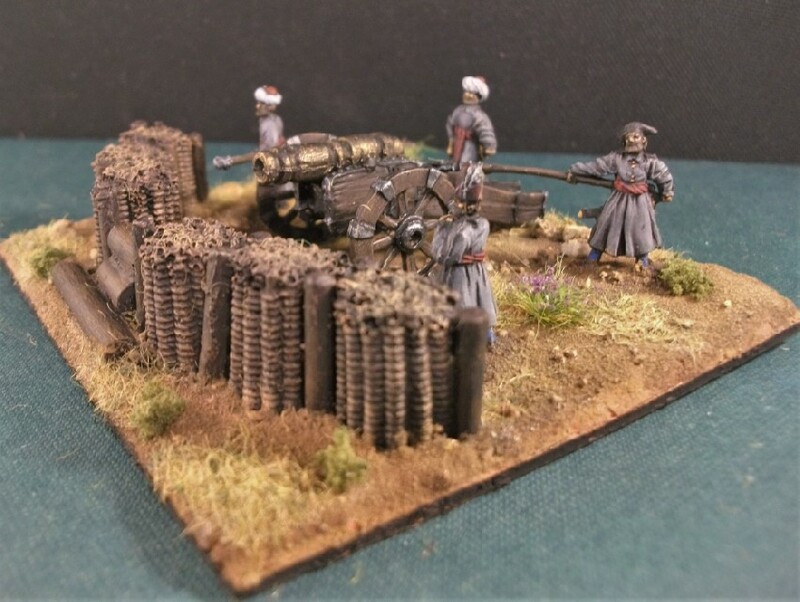 By the time of Bayezid II (1481-1512), up to 5,000 topcular (artillerymen) were serving in the corps. 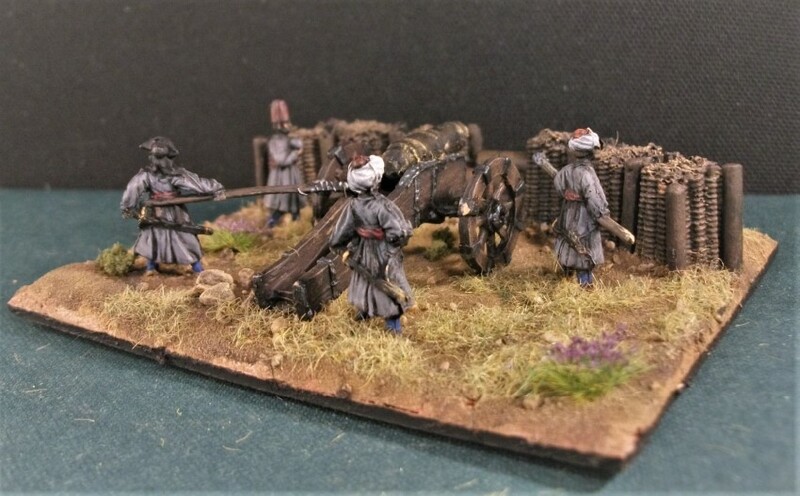 The Topcu Okagi specialised in all forms of siege warfare including the manufacture of ordnance and guns, mining, sapping, transport, labouring and siege works. Such was their sophistication that my Osprey guide suggests that their sapping and mining activities (trenches, saps, artillery emplacements) had more in common with WWI than the 16th/17th centuries. 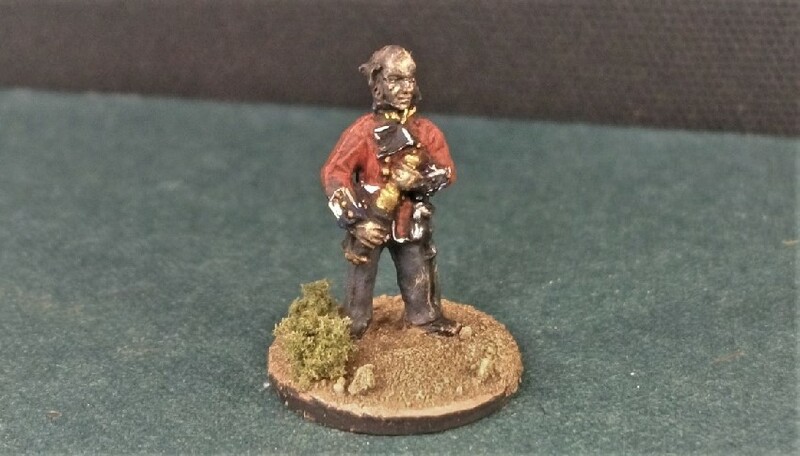 The figures contain an officer holding a quadrant, by which means he could (with some decent grasp of mathematics) calculate the desired angle of elevation on the gun barrel. 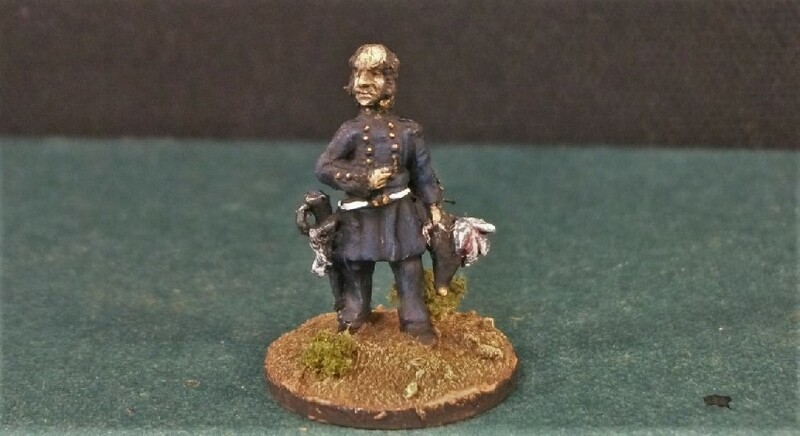 For a good overview of its use, see this post by the “To the Sound of the Guns” blog dedicated the American Civil War. It seems that such a device was still very much in use in the mid-19th century and, indeed, has not entirely disappeared from gunnery even today! 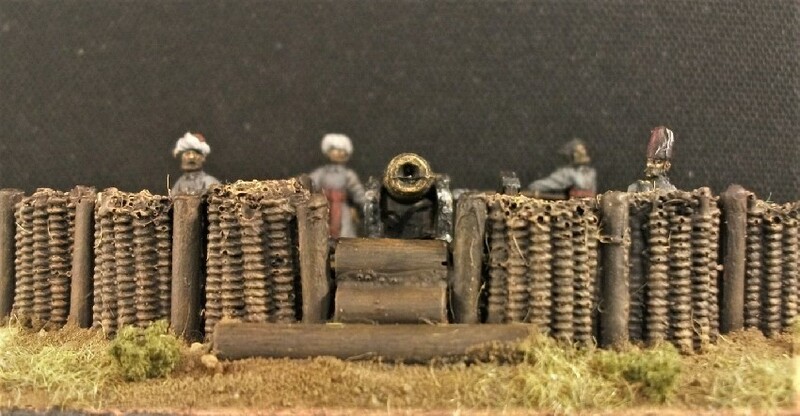 Once more, I’ve made use of the very convenient and effective gabions by Anyscale Models, used in my two other sets (the 17th Century field gun crews and the Humbaraci Corps Mortars). 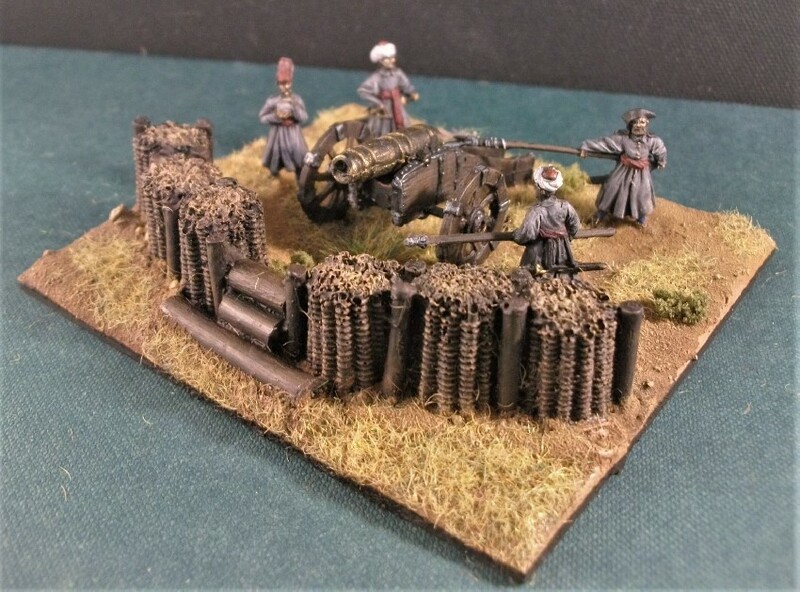 I’ve even enough left over for the remaining box of Turkish 16th Century artillery… but that will probably be left now for another day, as that’s quite enough for now! 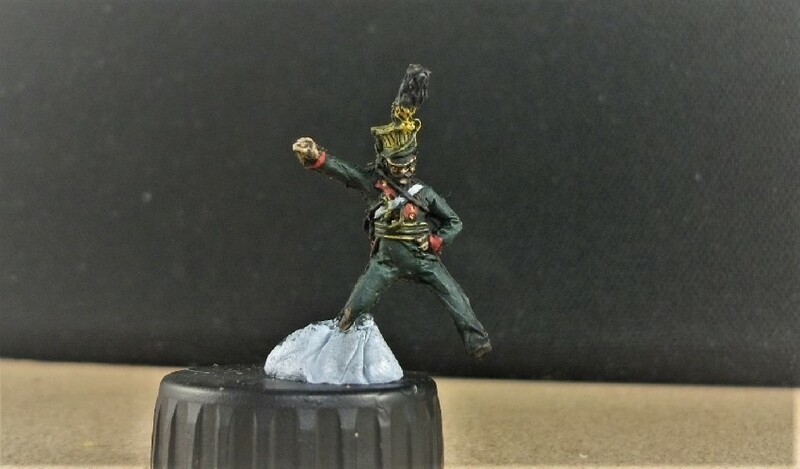 Next up on my painting table is a return to more familiar territory and finishing off those Mars Austrians for the good old Nappy Cavalry Project! 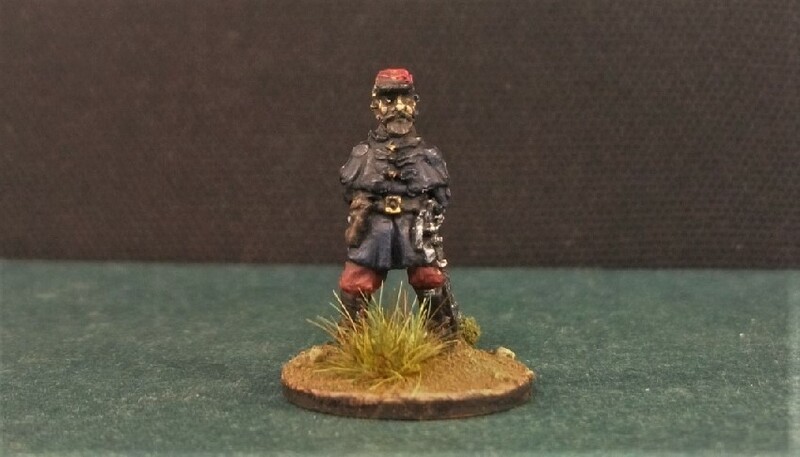 A quick update on my Mars Austrian Uhlans. 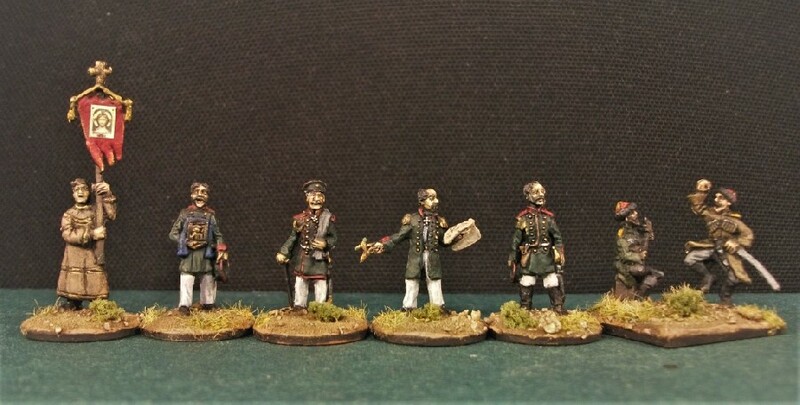 The figures are almost there, but there is a little more work to do including some paint still to be applied on the Czapkas amongst other things. 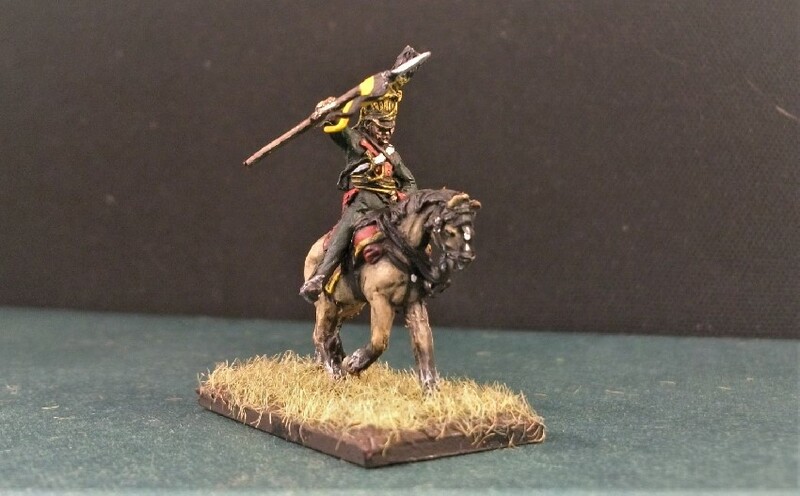 The horses are next up on the painting table and also looming is the question of lances. I’ve decided that the lances provided by Mars require too much effort removing from the flash. There are also no pennons provided and so would require their manufacture. 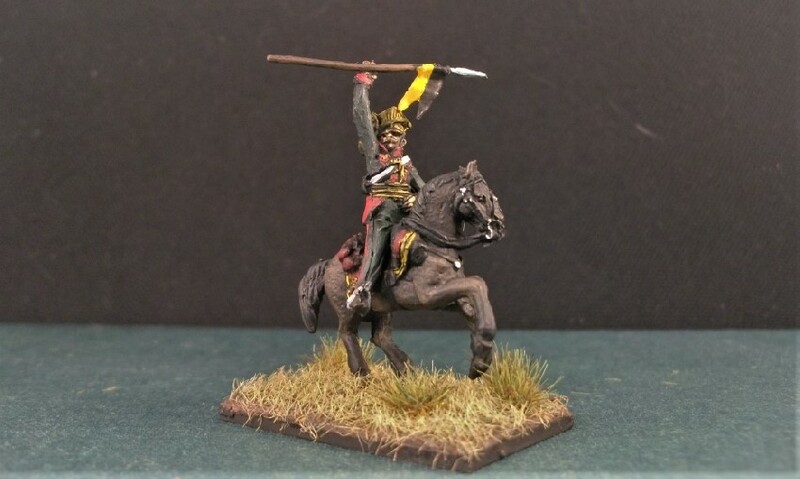 Consequently, I’ve opted to source some lances from another set, possibly from some of my old Esci Polish lancers. 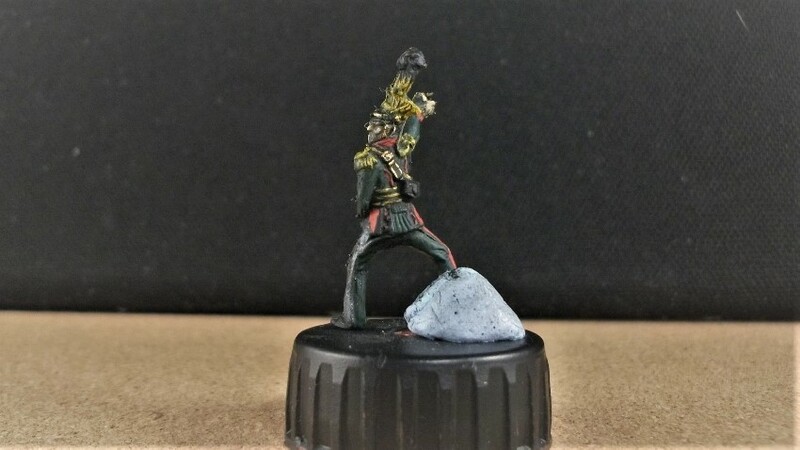 The next challenge will be how on earth to affix them to the figures, the hands being extremely vague and amorphous! 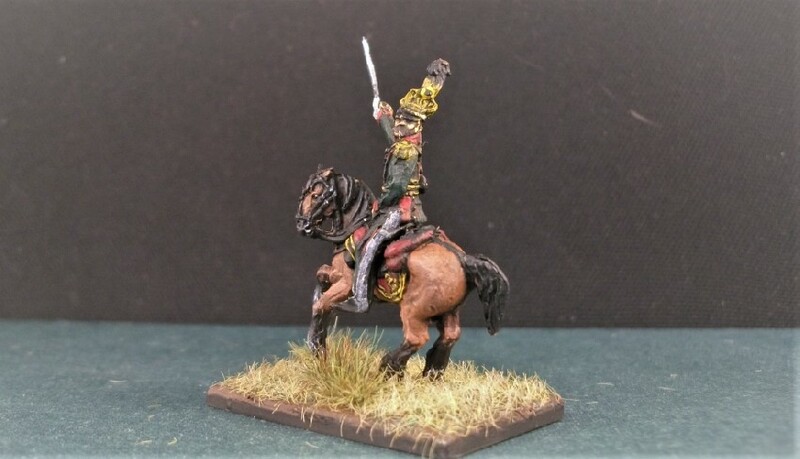 Mounting them on horses will be another interesting challenge, a couple of the poses and postures being a little strange, I think. It makes for an interesting and different figure, however. Aside from these technical issues, I’m pleased with how they’re looking now they’ve got some paint on them. 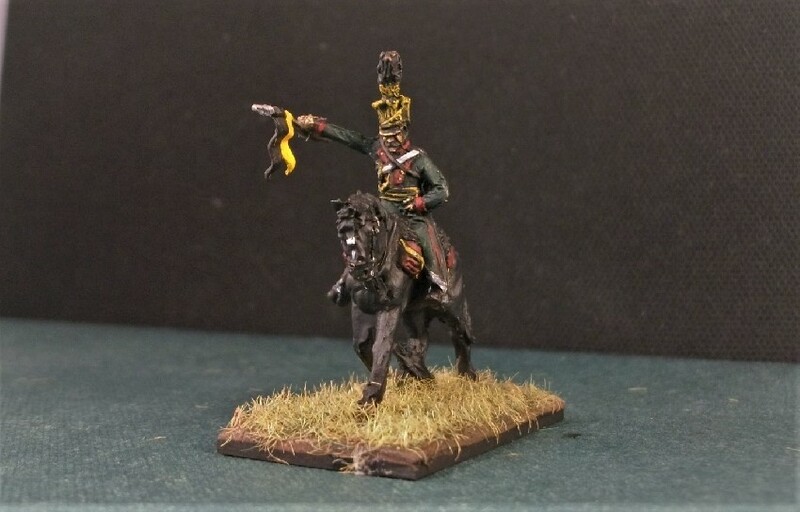 An update, hopefully with mounted and lance-armed uhlans, to come in due course.